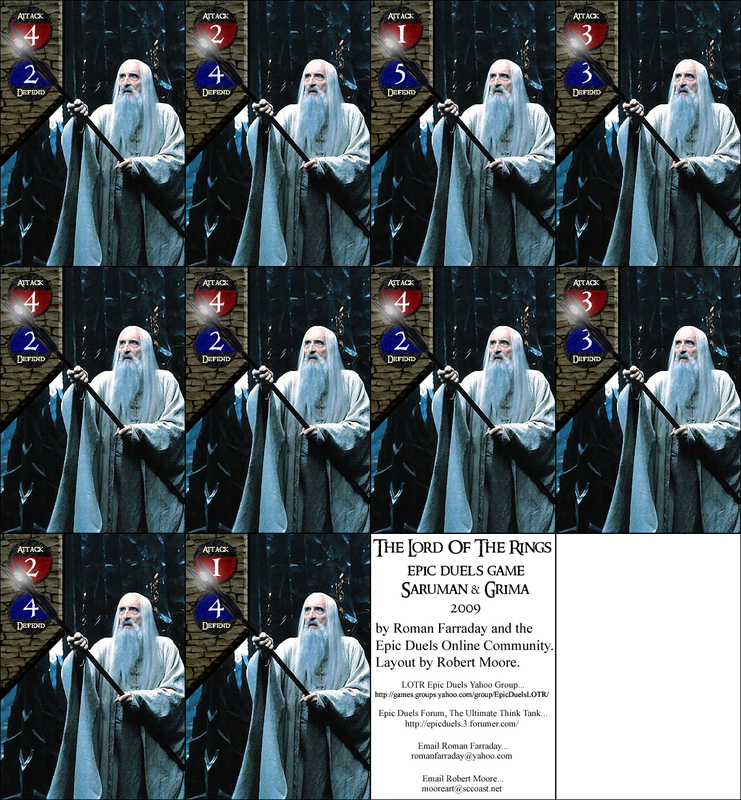 This page has seen a lot of traffic lately (Jan 2019). 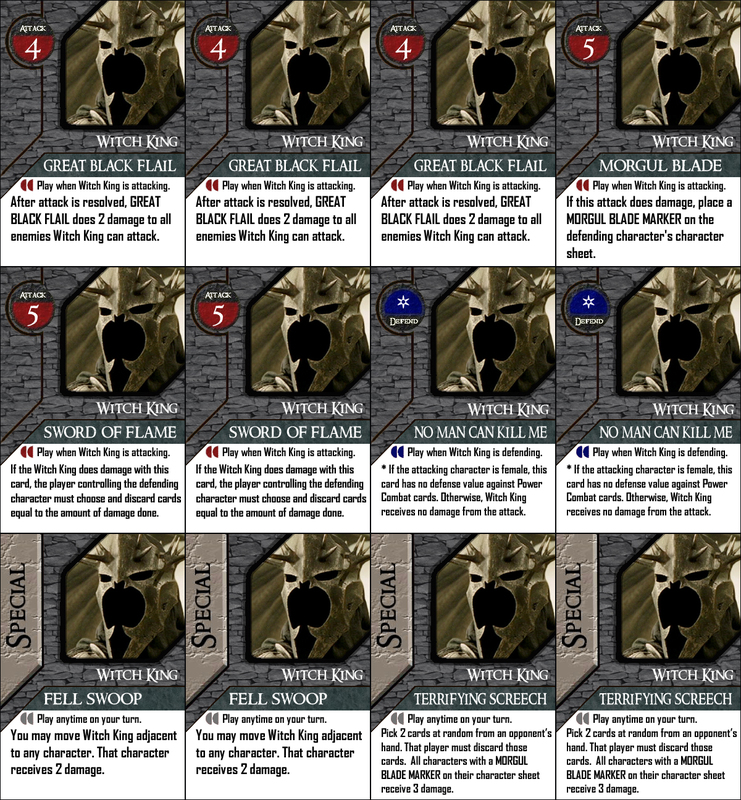 If you’re printing or just interested in a LOTRED set, let us know in the comments! 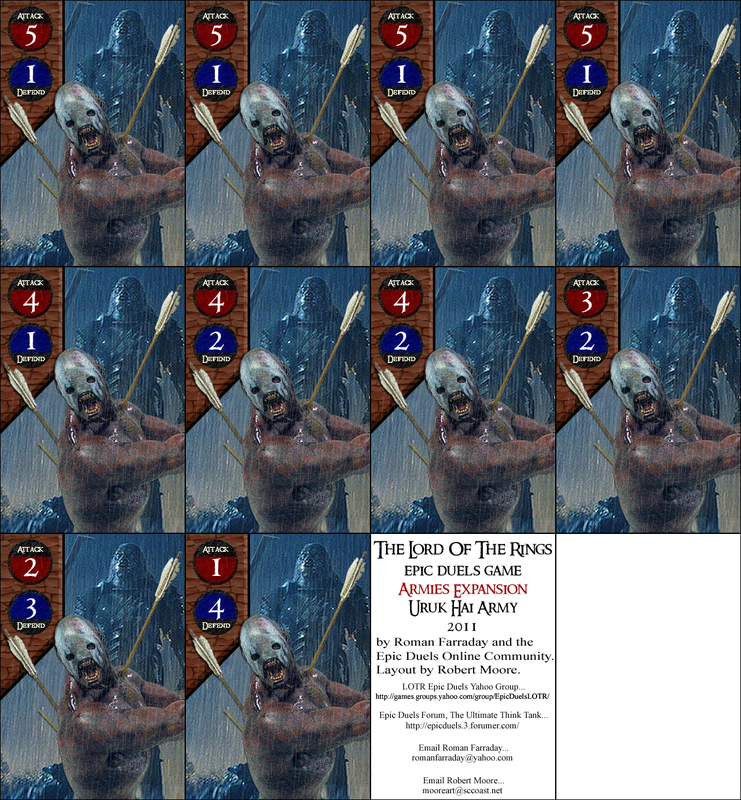 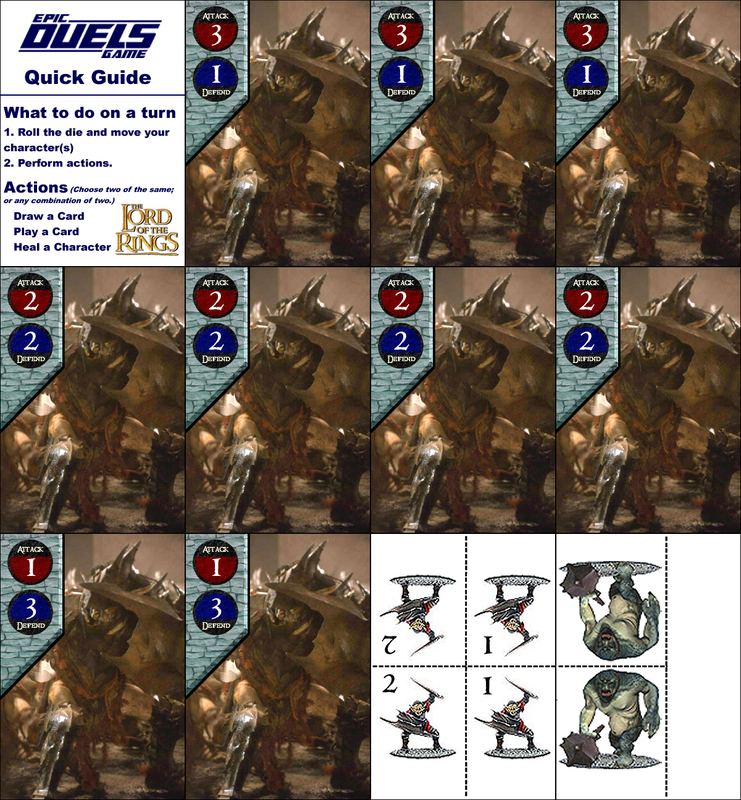 Download all the decks and battle cards you want to print to a directory on your computer. Each deck has 3 pages + one page of backs. 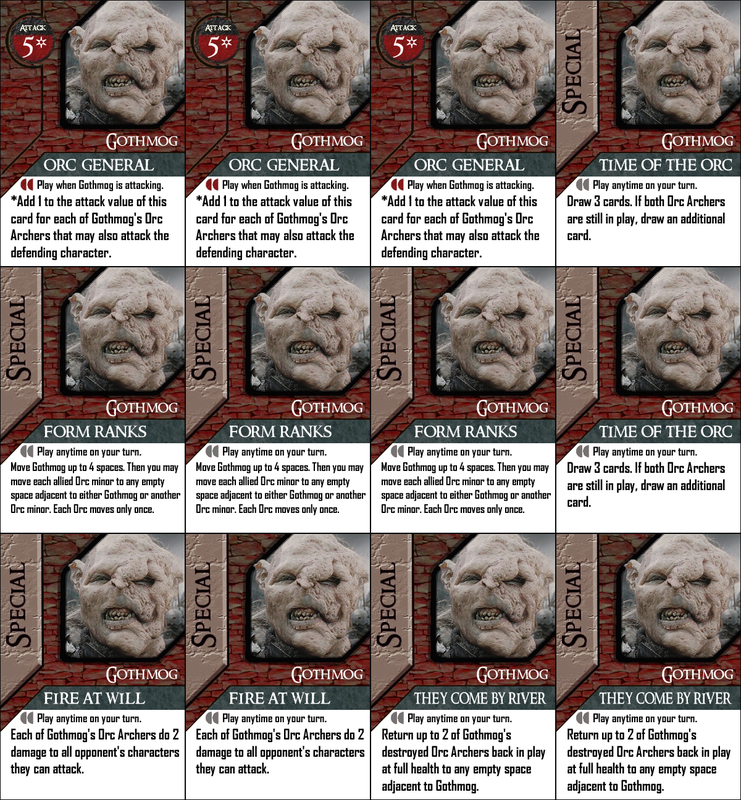 Best bet is to print the backs out first, 3 copies. 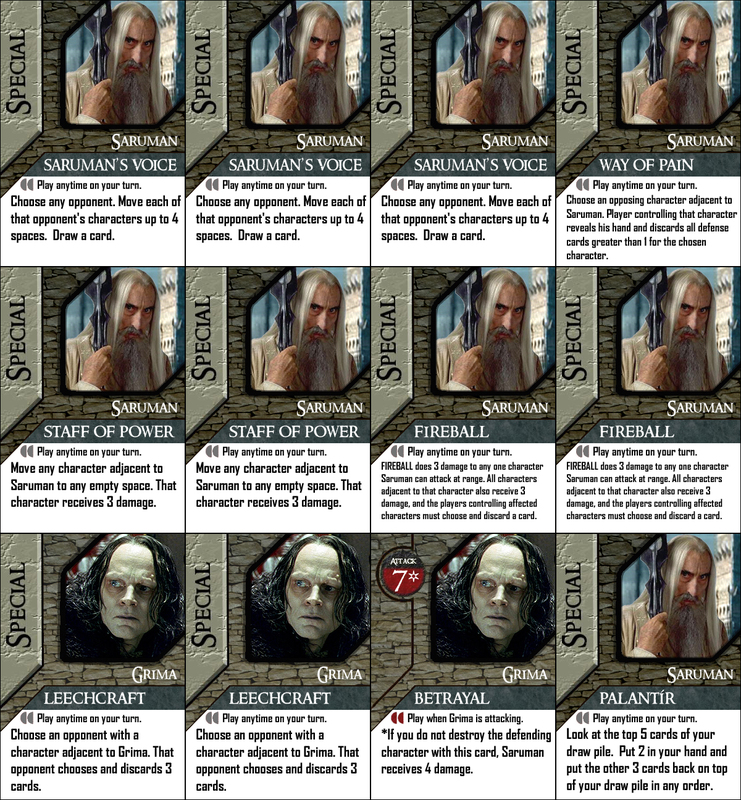 Then print the talents and basics on the reverse side. 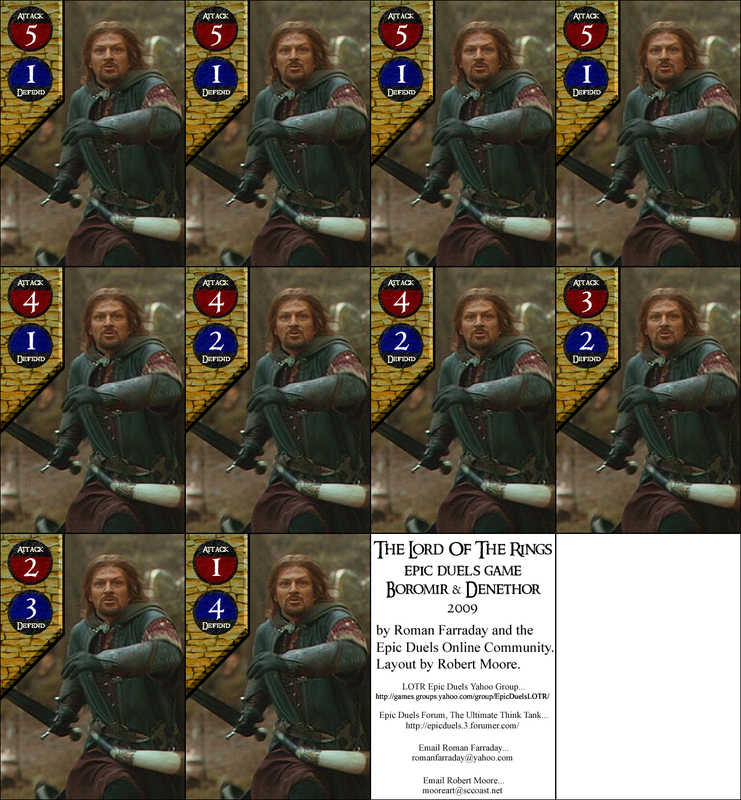 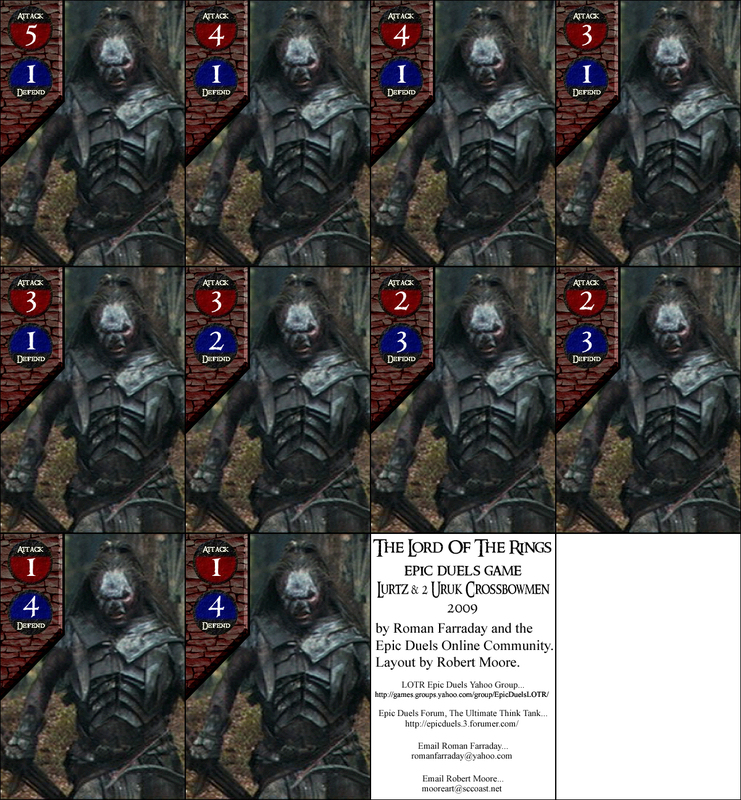 Print out the 6 pages of battle cards. 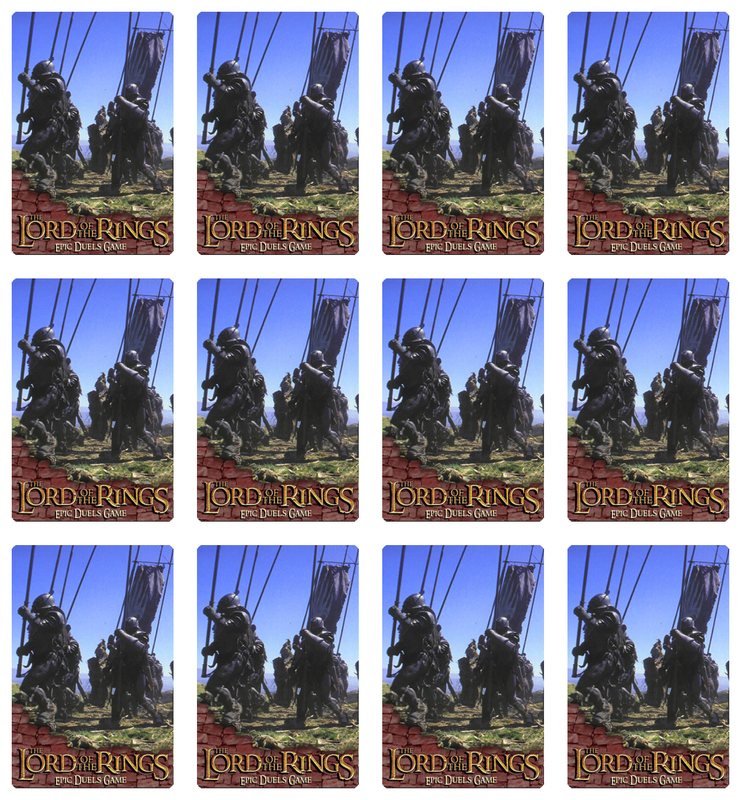 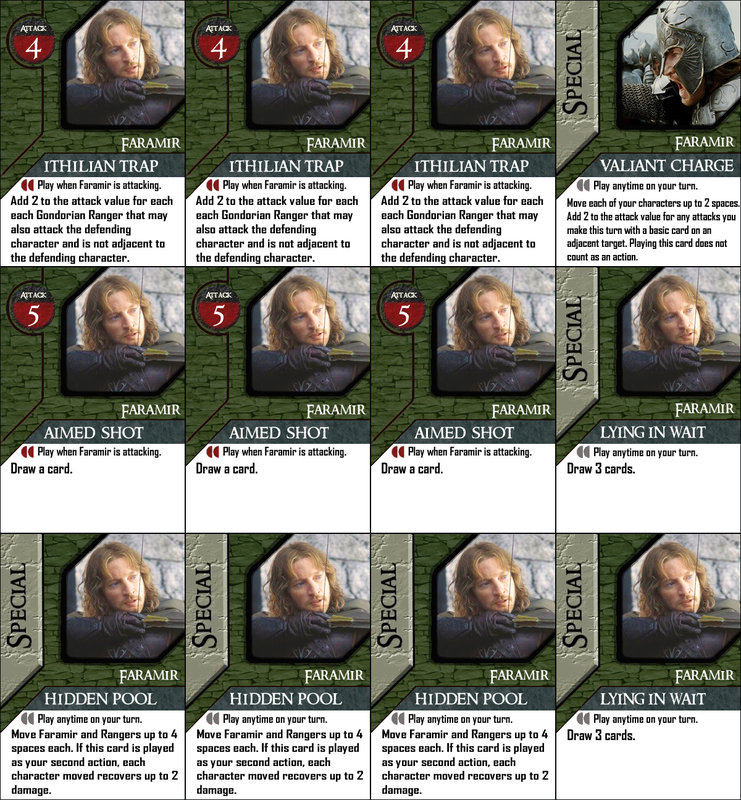 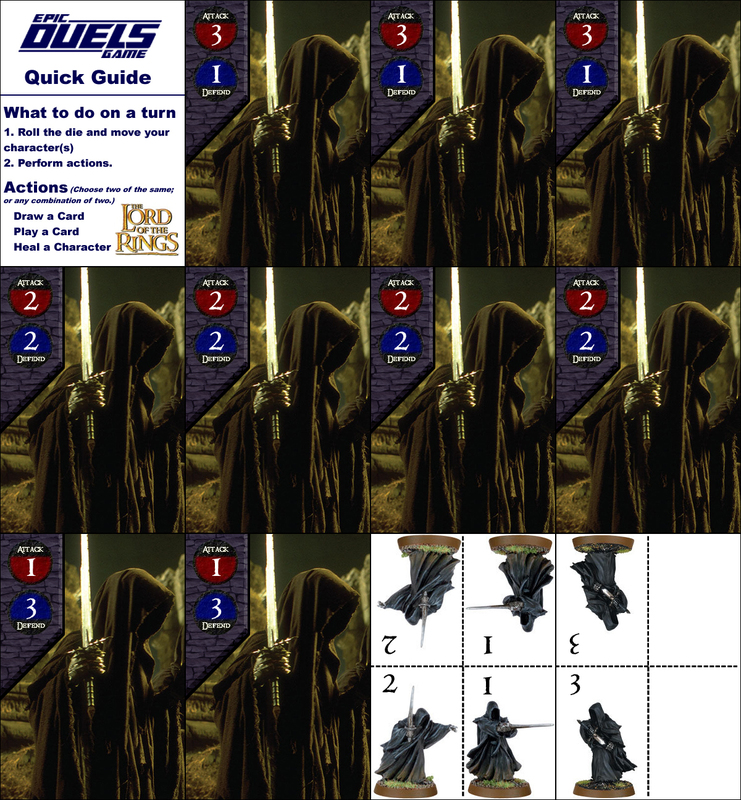 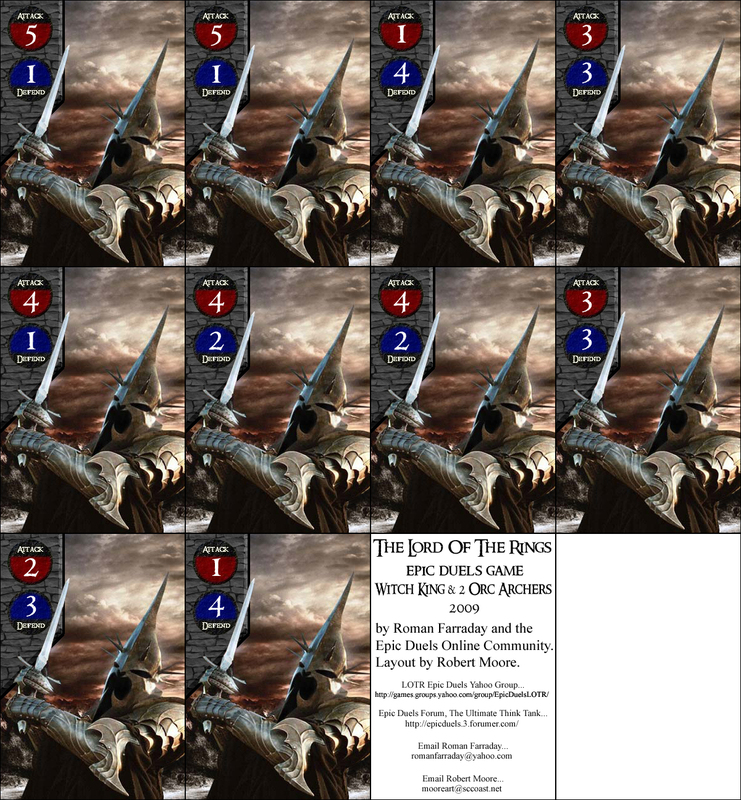 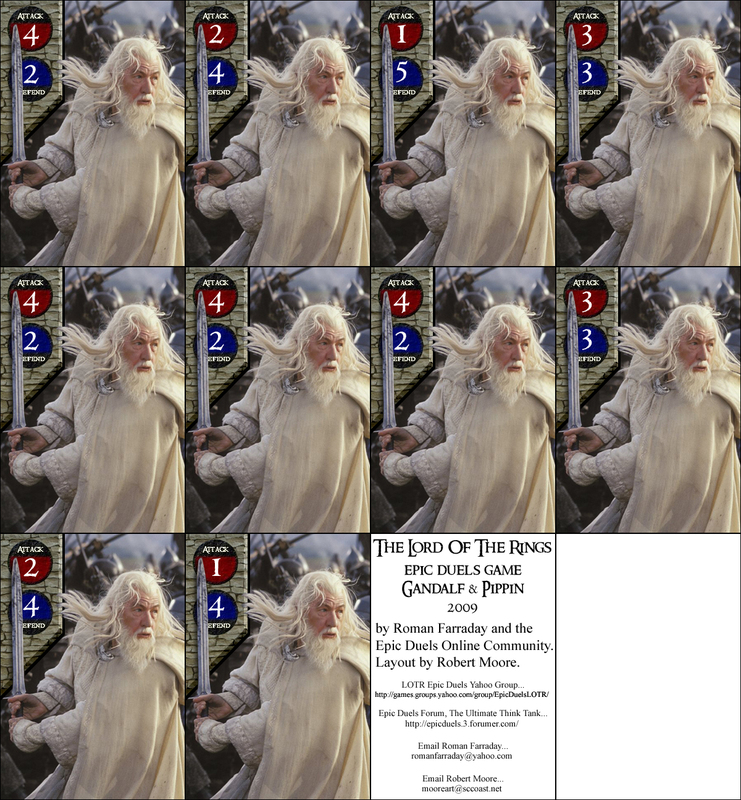 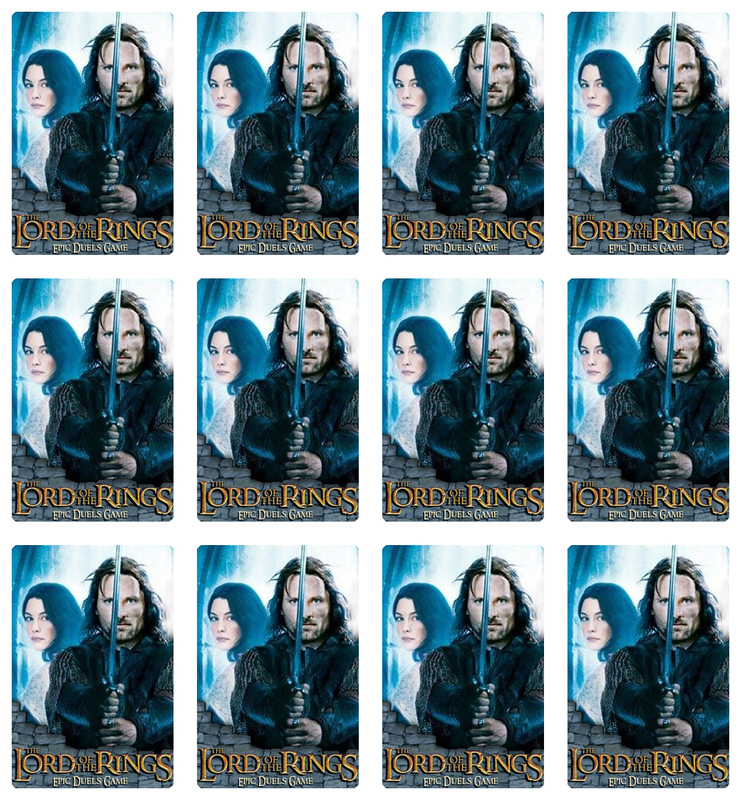 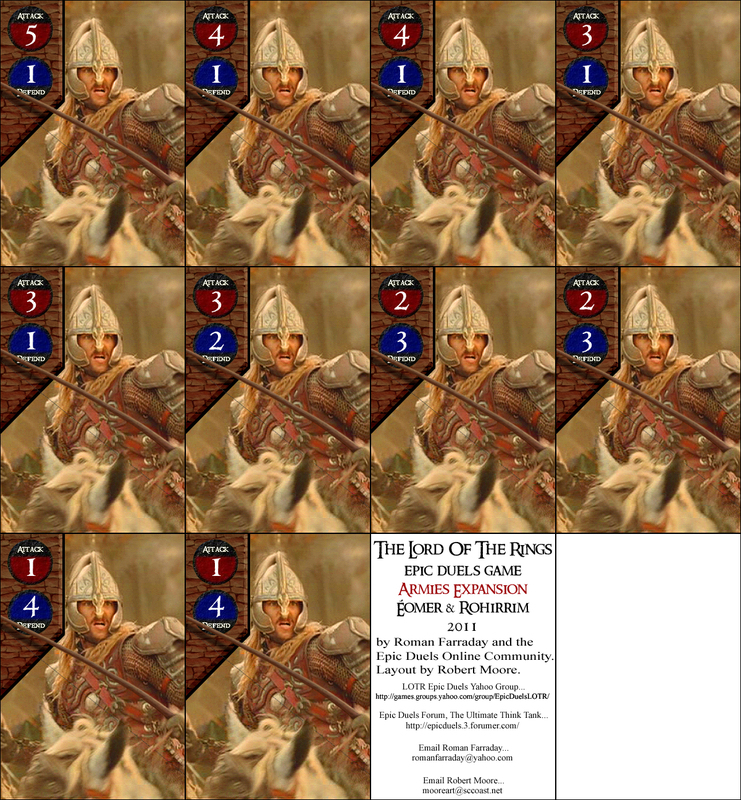 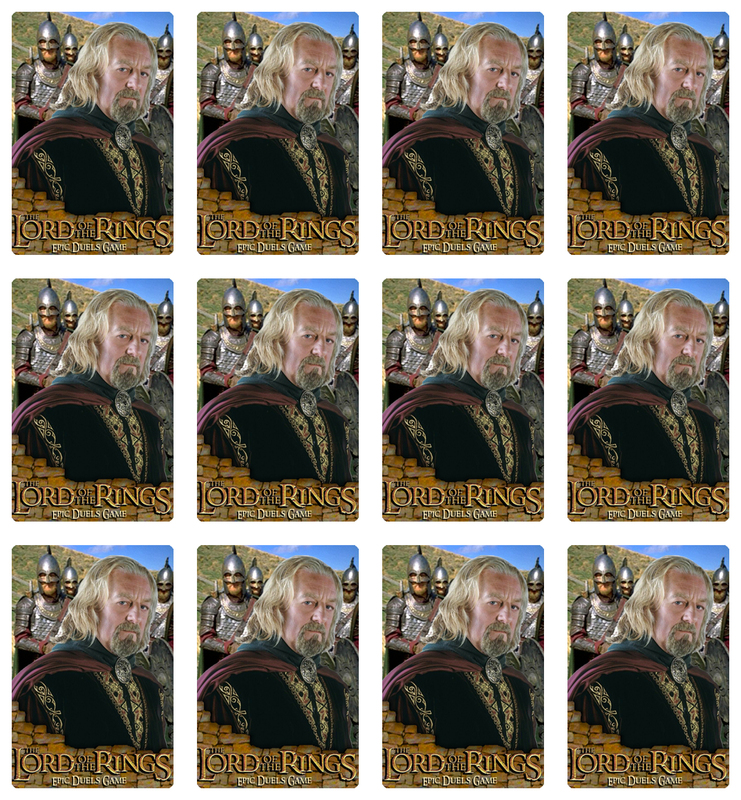 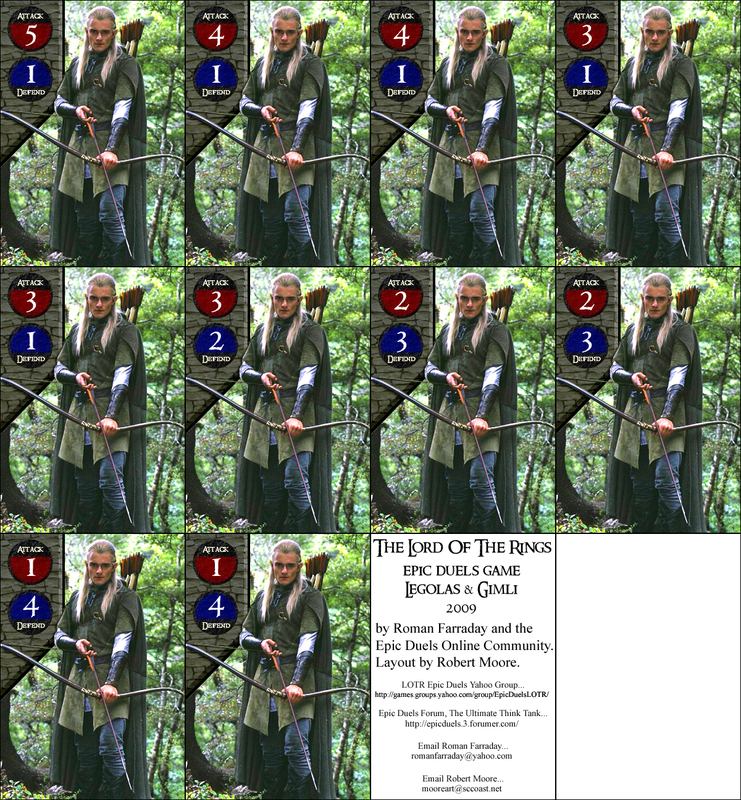 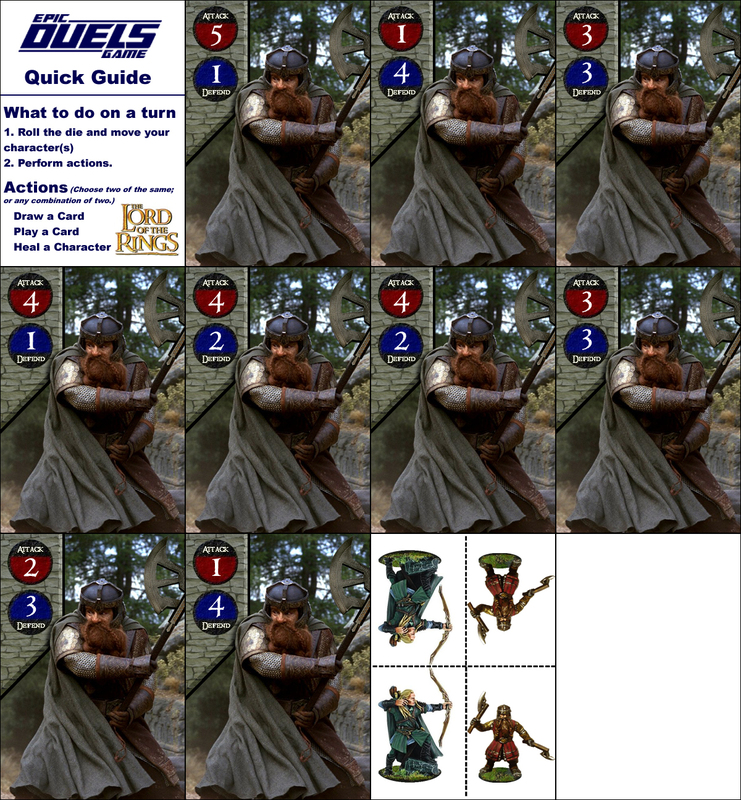 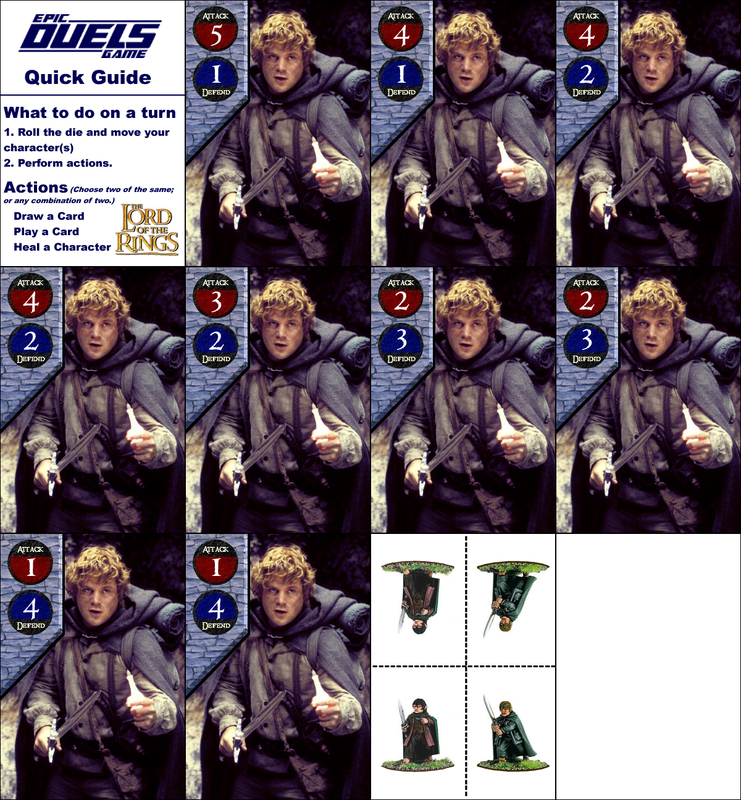 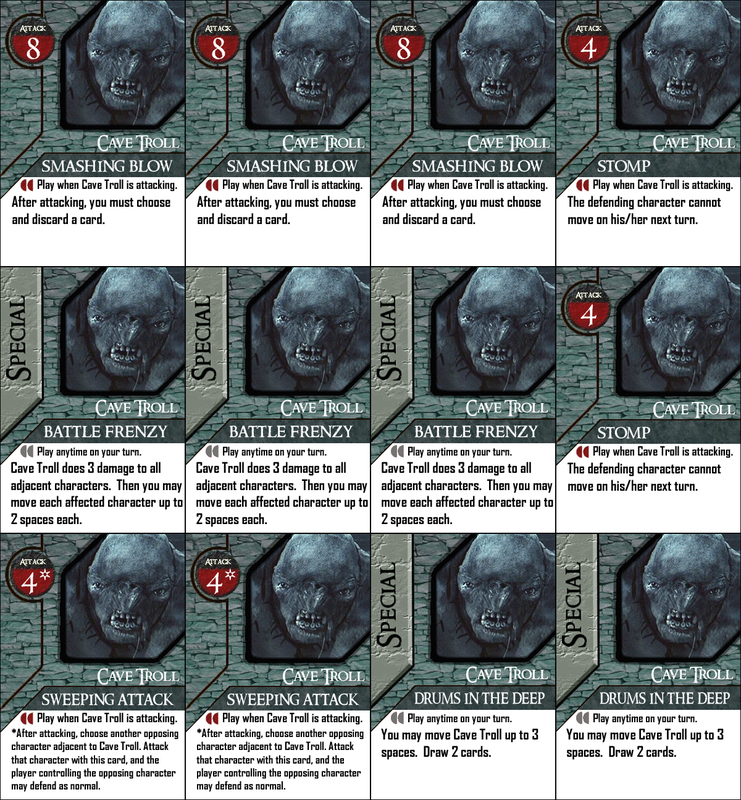 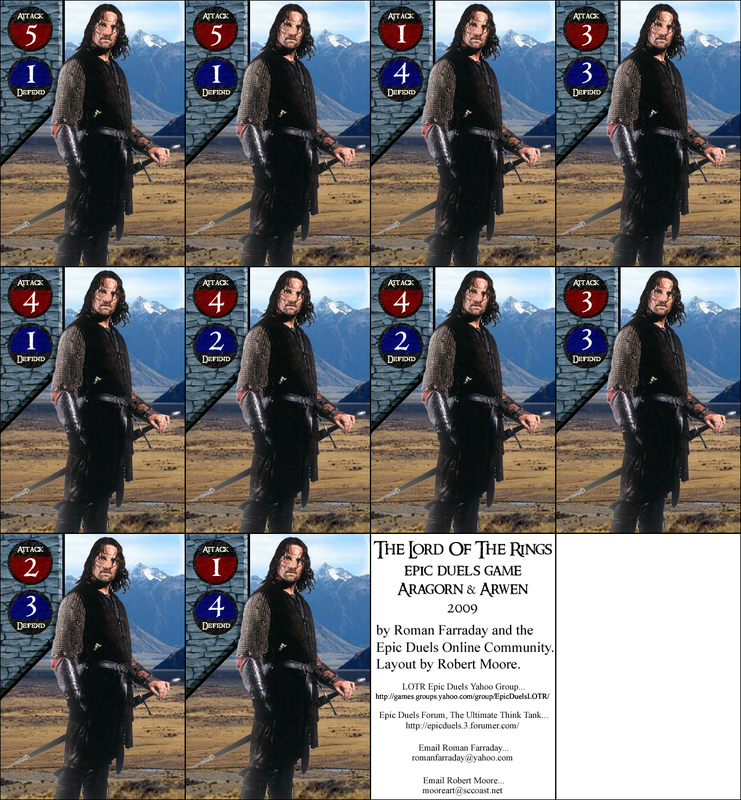 Each page holds 2 battle cards, so they are duplicated, but you will find this out if you download everything first. 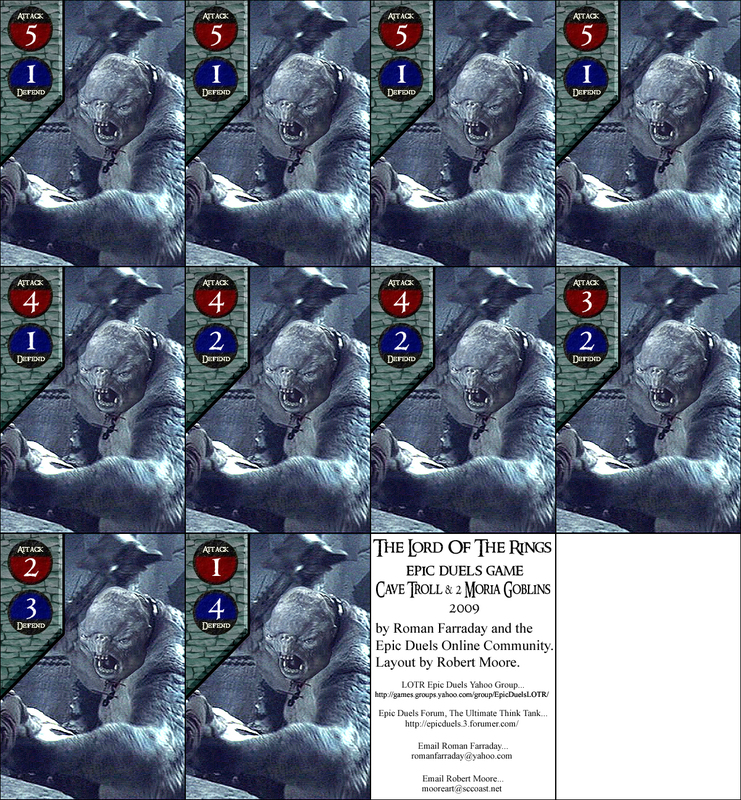 Six more decks! 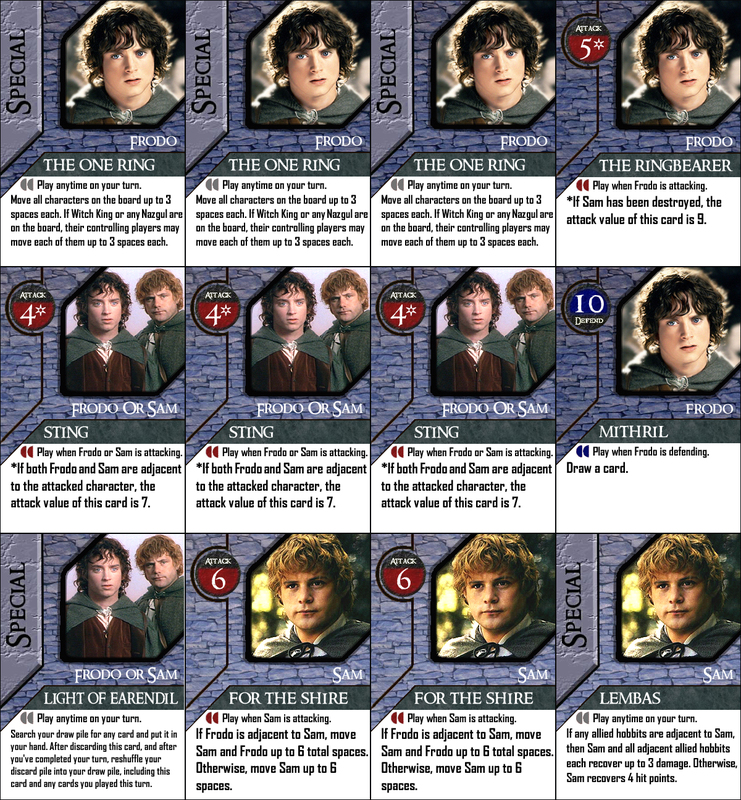 Faramir and Sharku were going to be part of the original set but with the project taking a long time, they were trimmed off to get to completion. 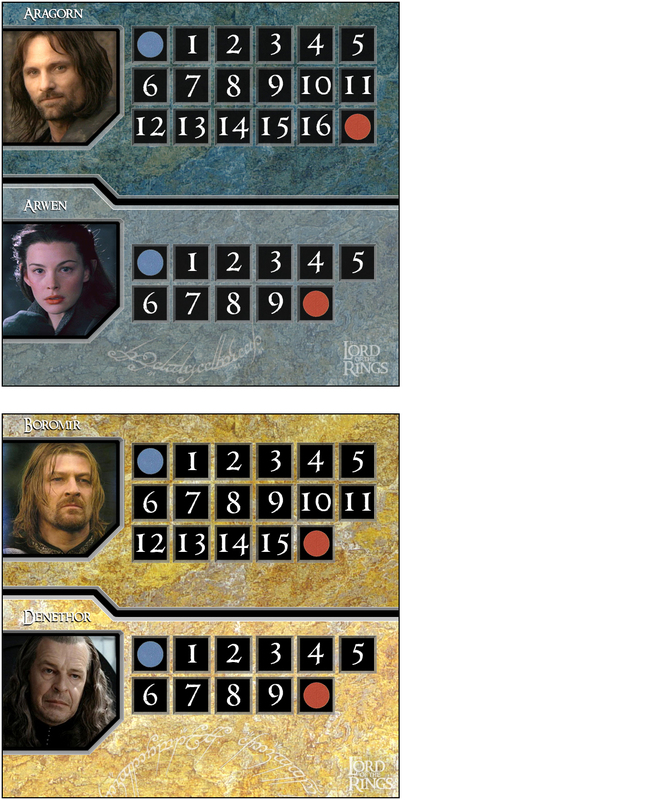 Why “Armies?” Because this expansion is just a tiny selection of the characters out there, and all of these character sets have 3 characters or more. 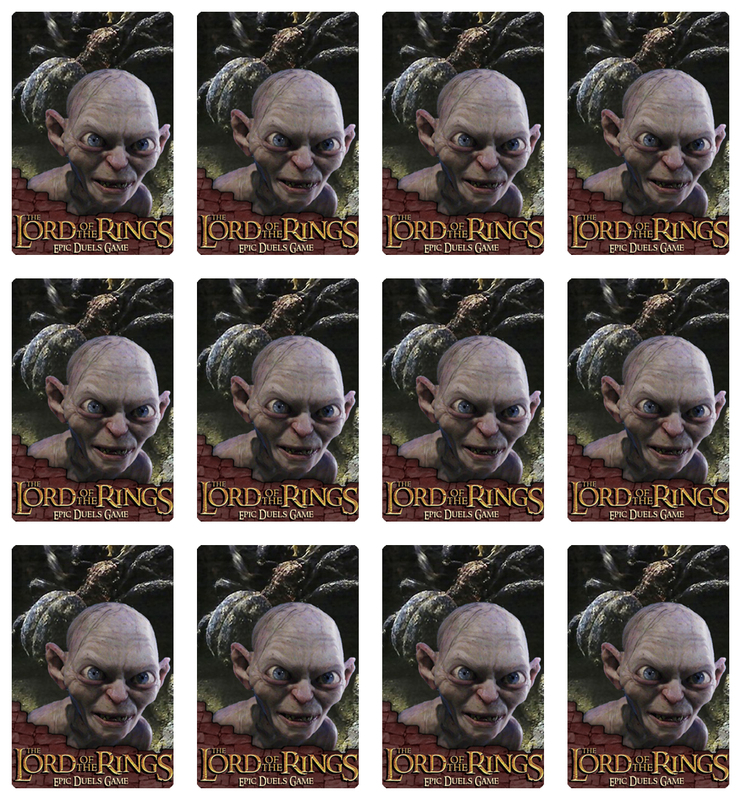 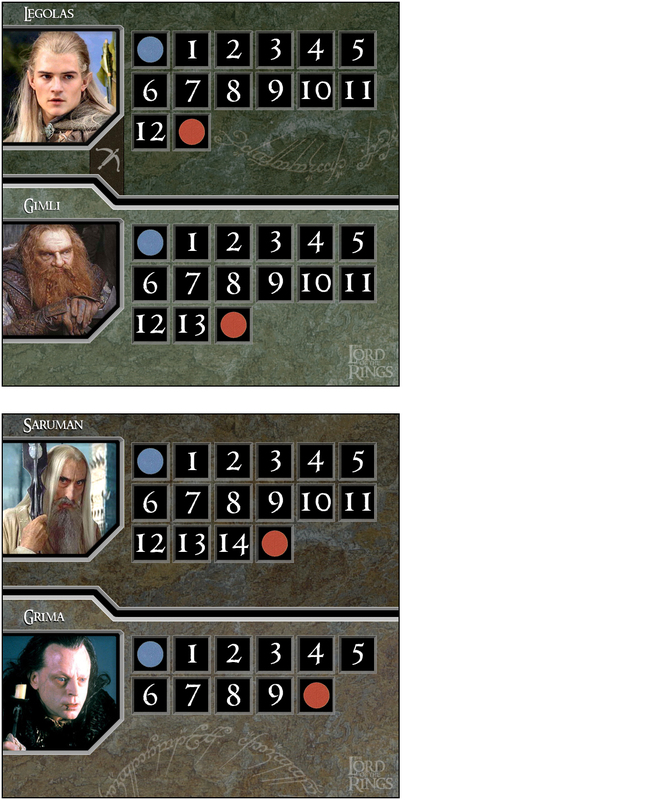 We have discussed a “Legends” expansion with Elrond and Isildur and a “Giants” expansion with Ents and Sauron. 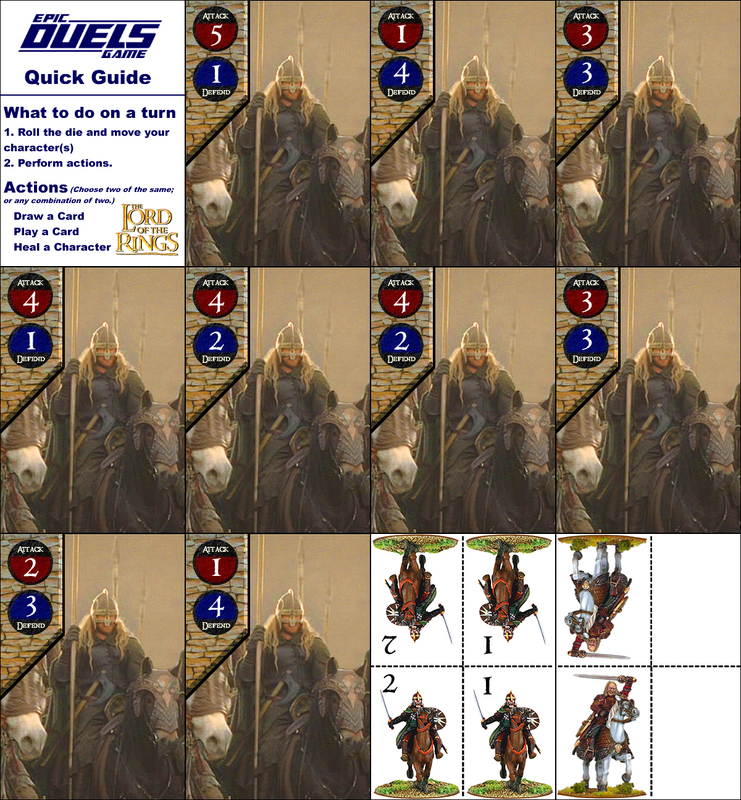 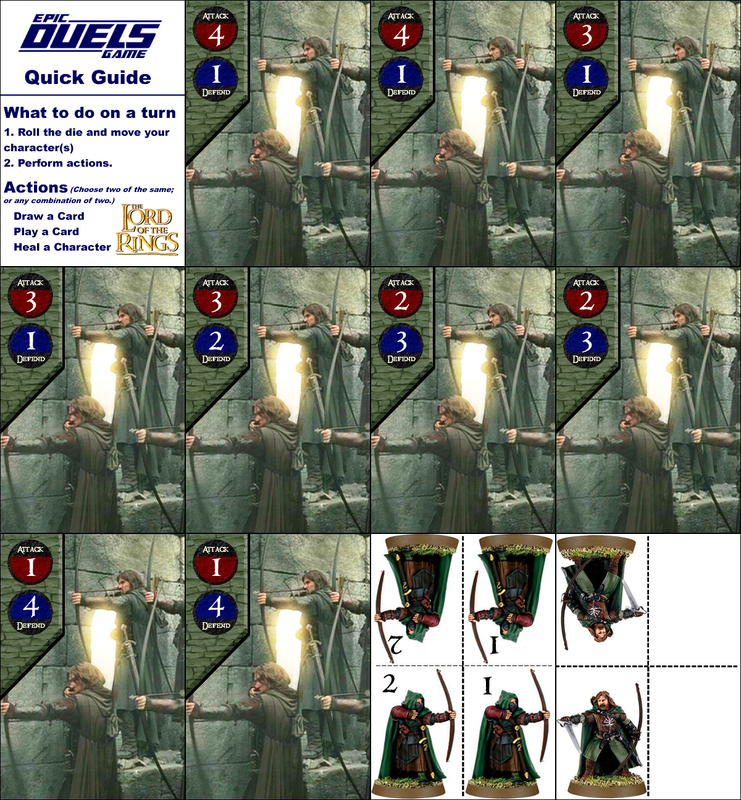 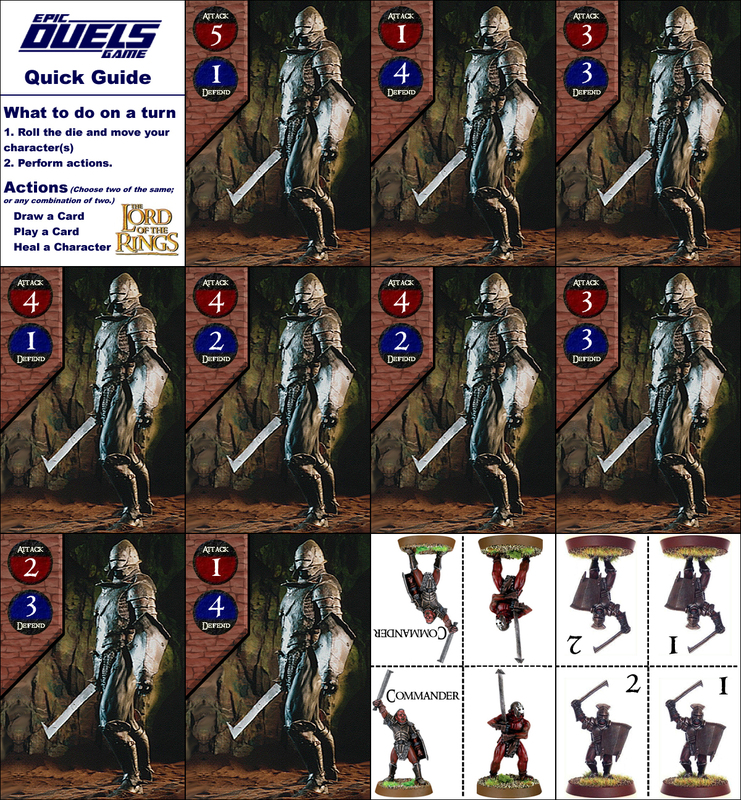 For those who know me, I can be a stickler about following the “rules” of Epic Duels design, but this set represents some heavy breaking of rules, and to what I think are great results. 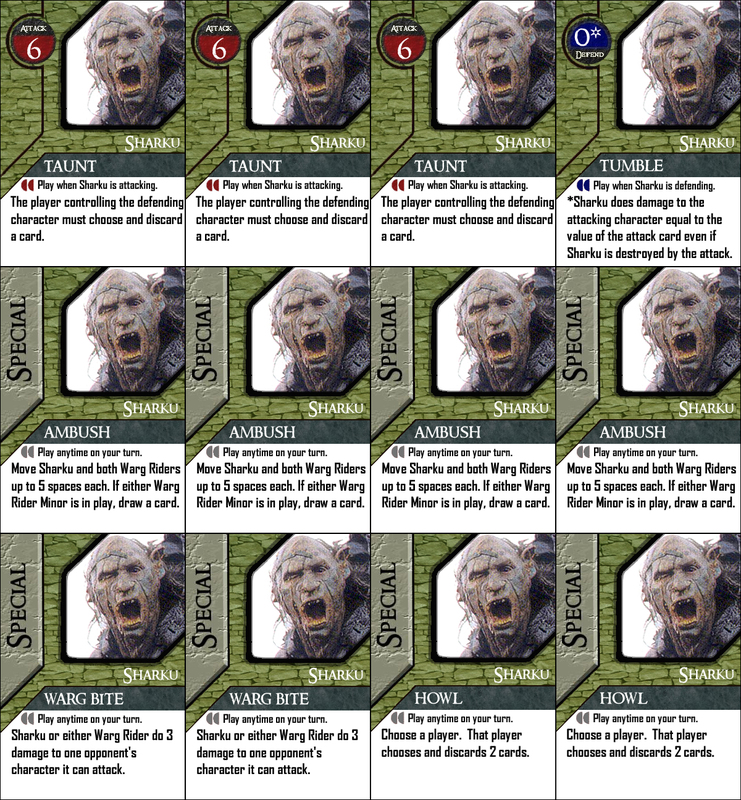 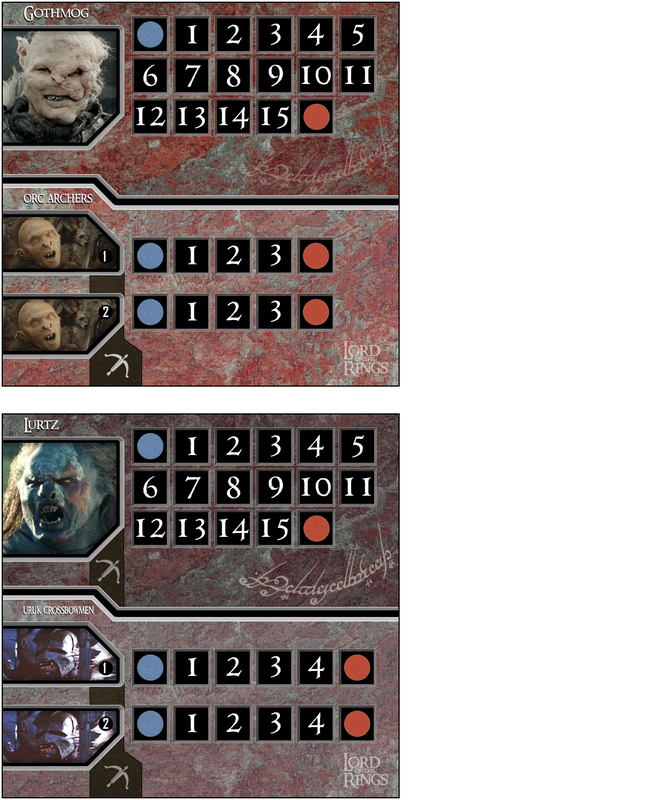 The Uruk-Hai army, mostly developed by Robert Moore, has dual majors along with 2 minors, but it works. 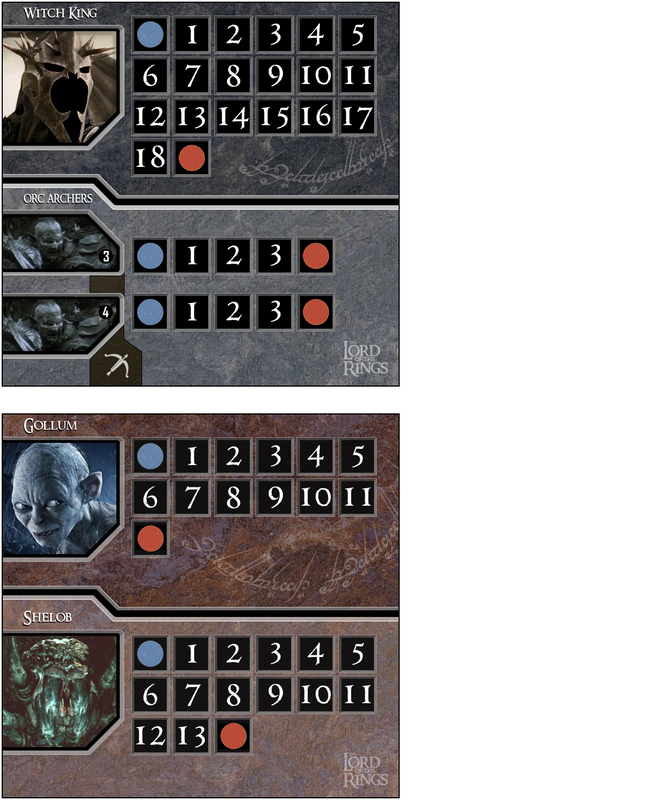 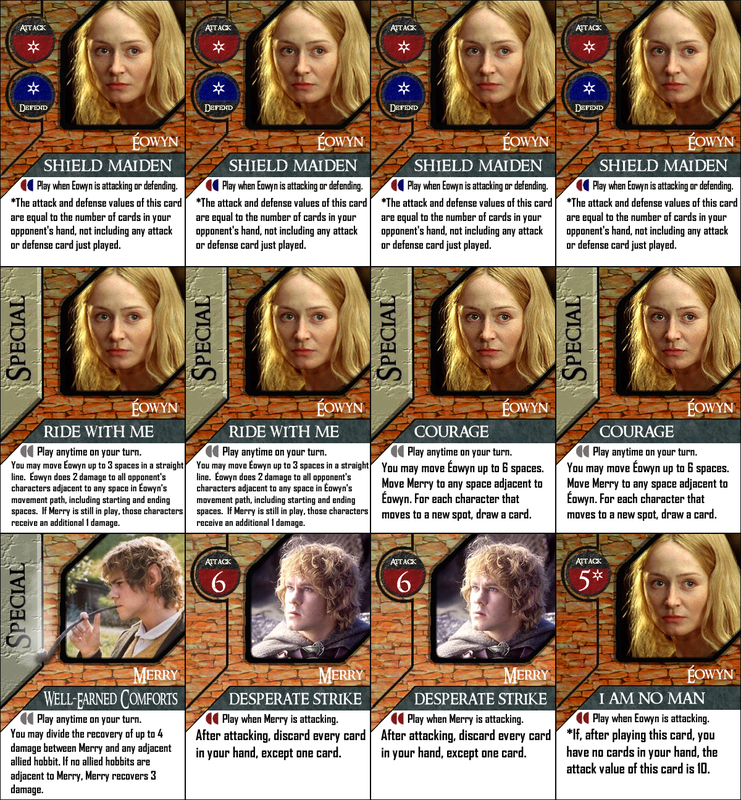 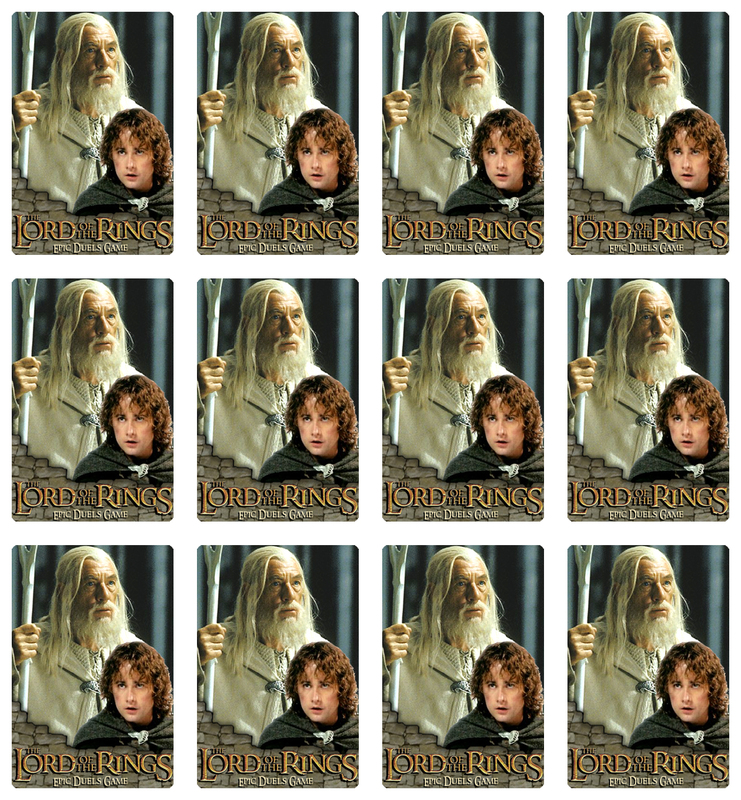 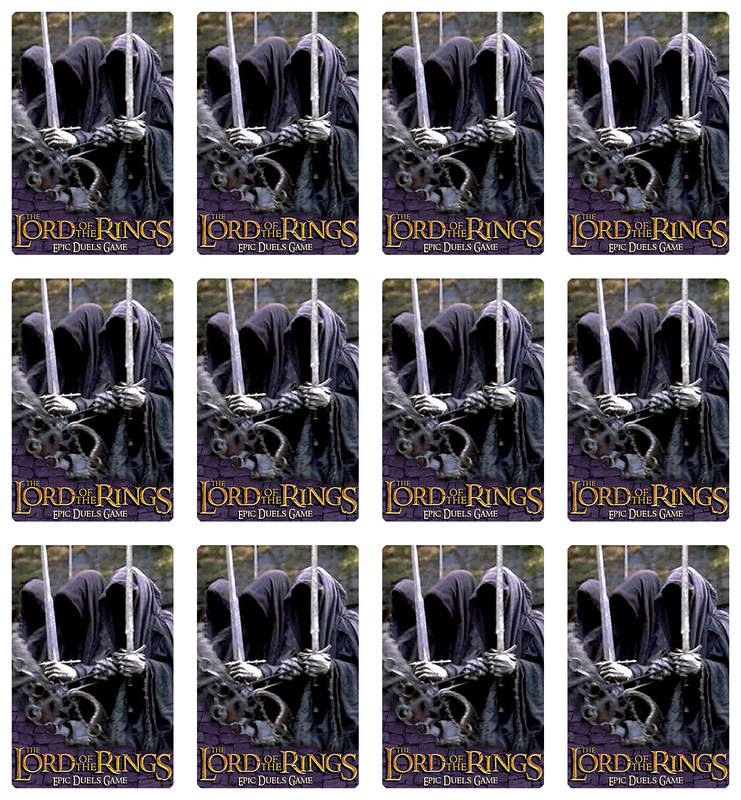 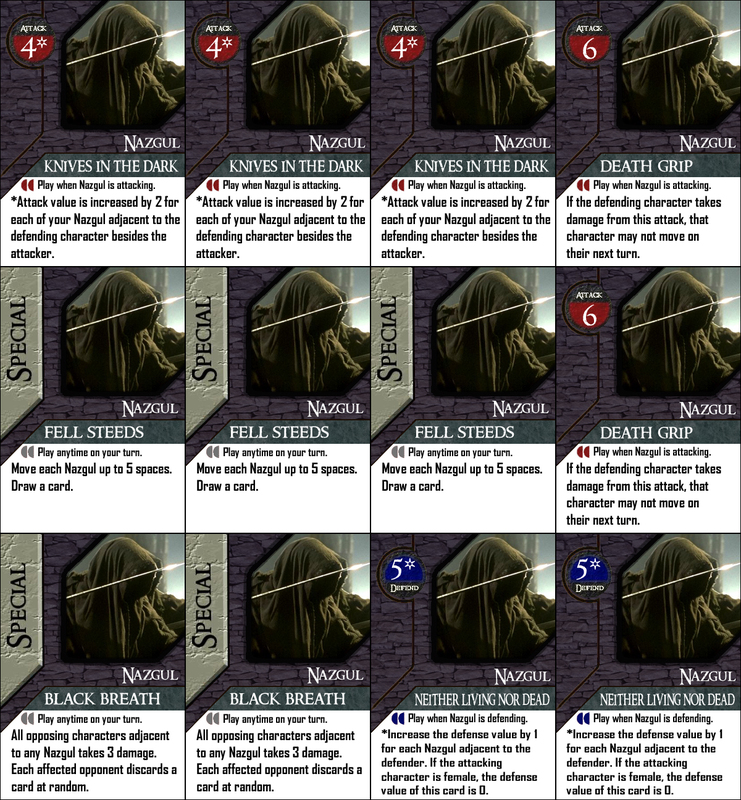 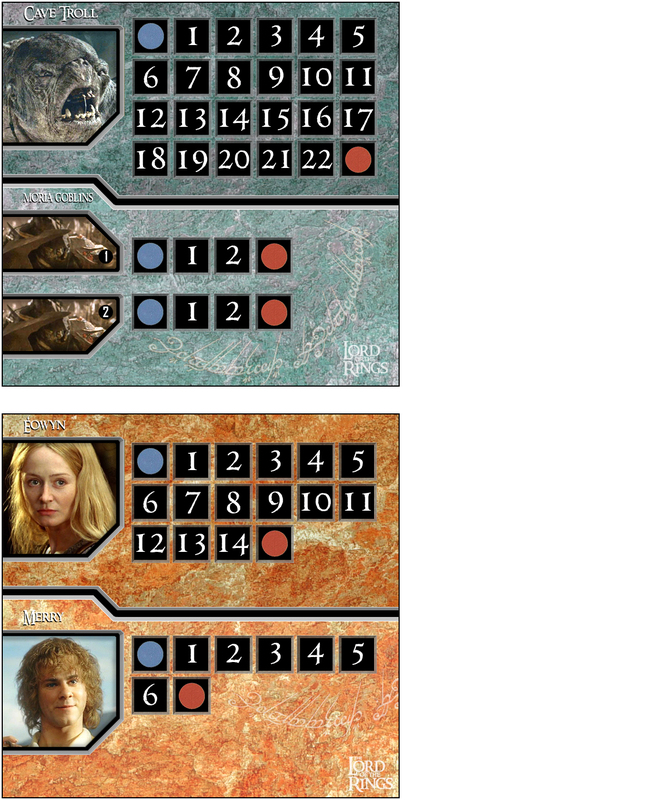 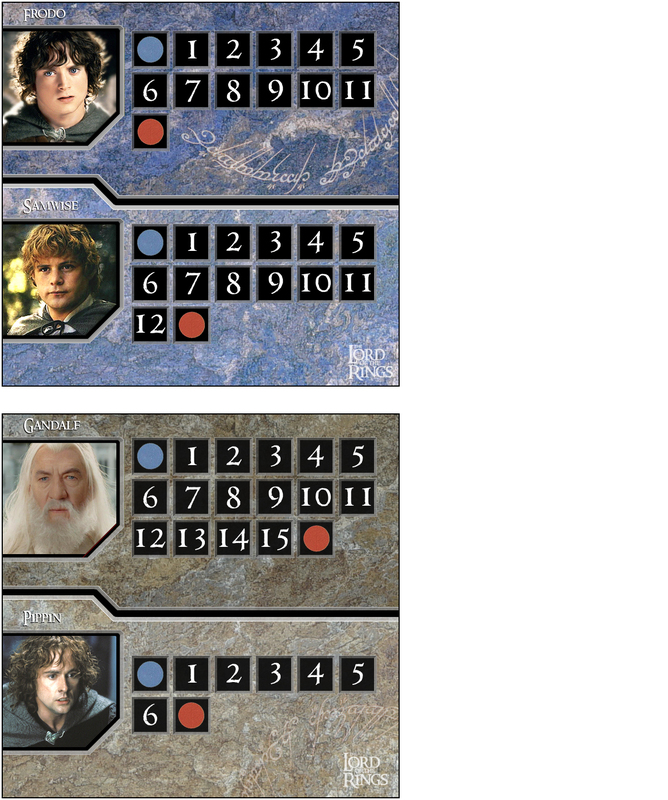 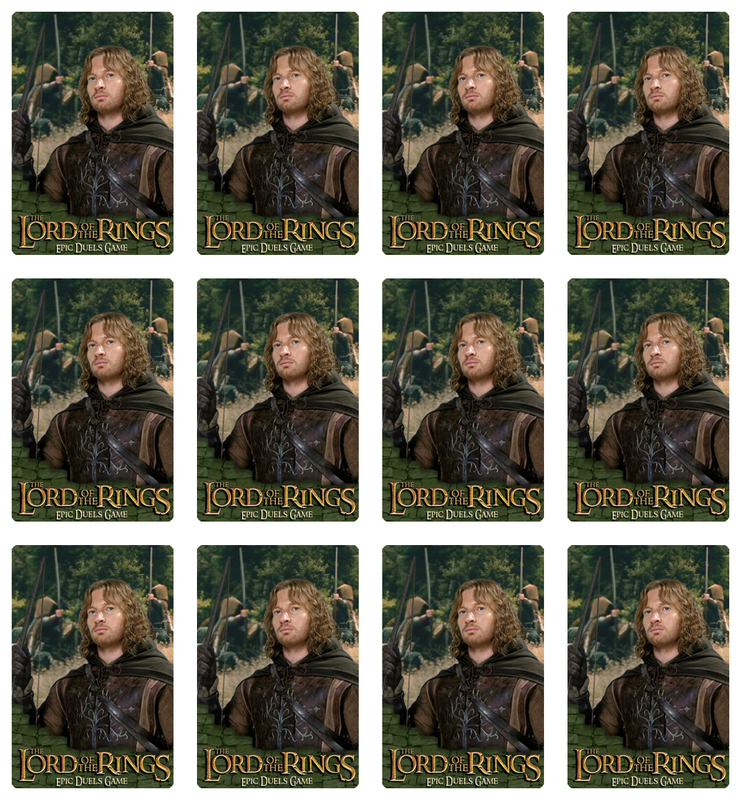 So does the Nazgul deck, featuring 3 indistinguishable major/minors. 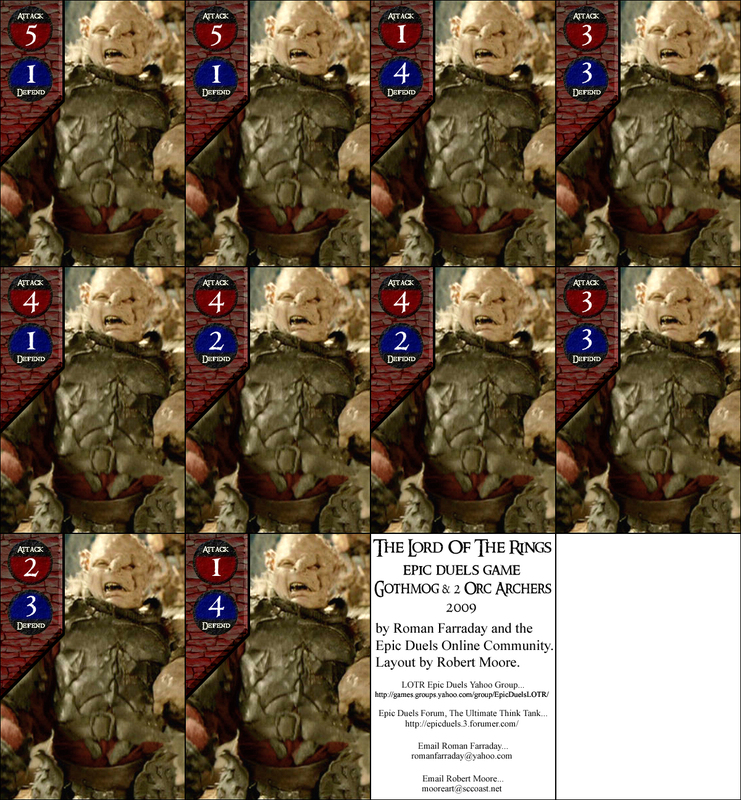 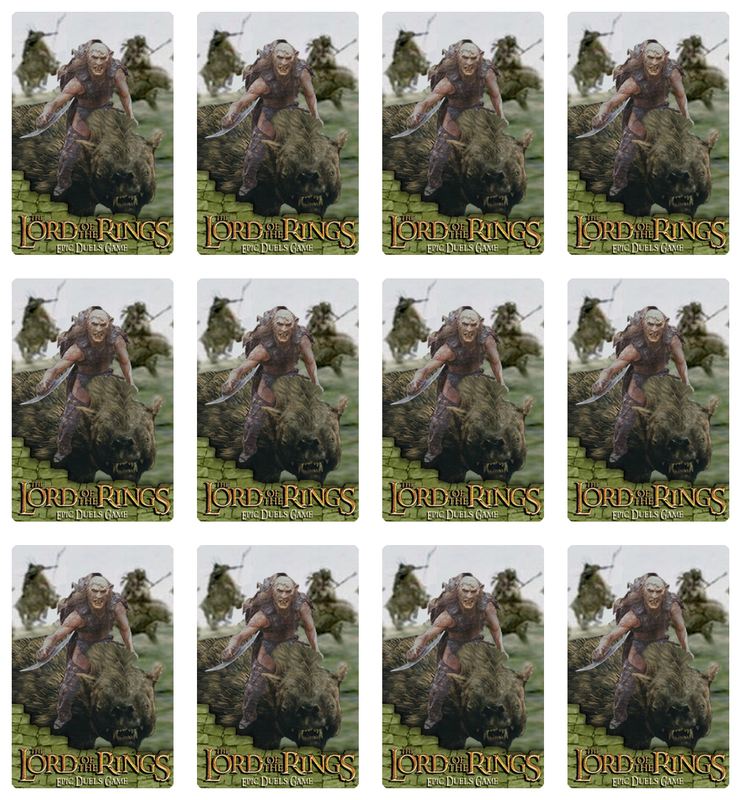 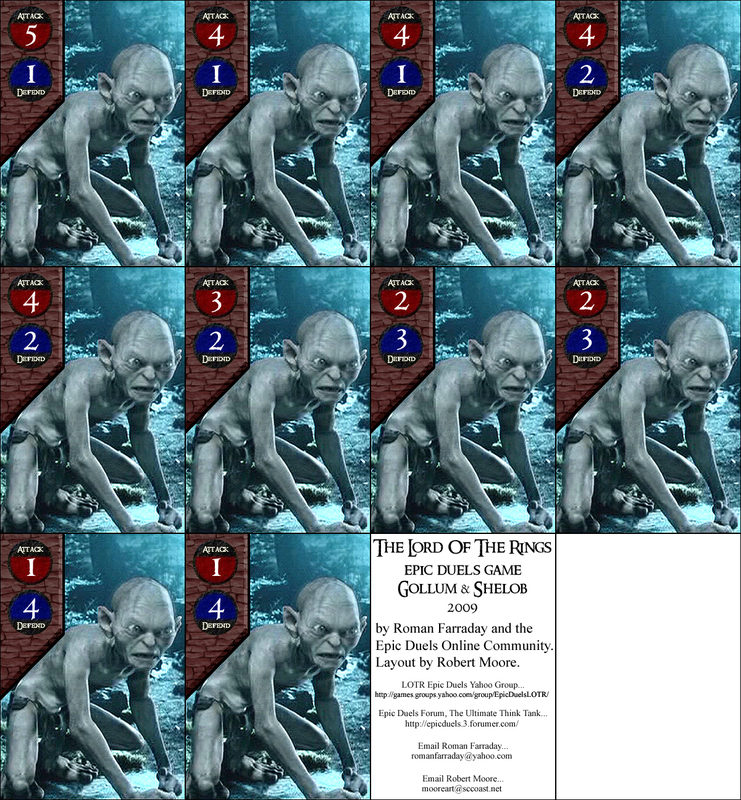 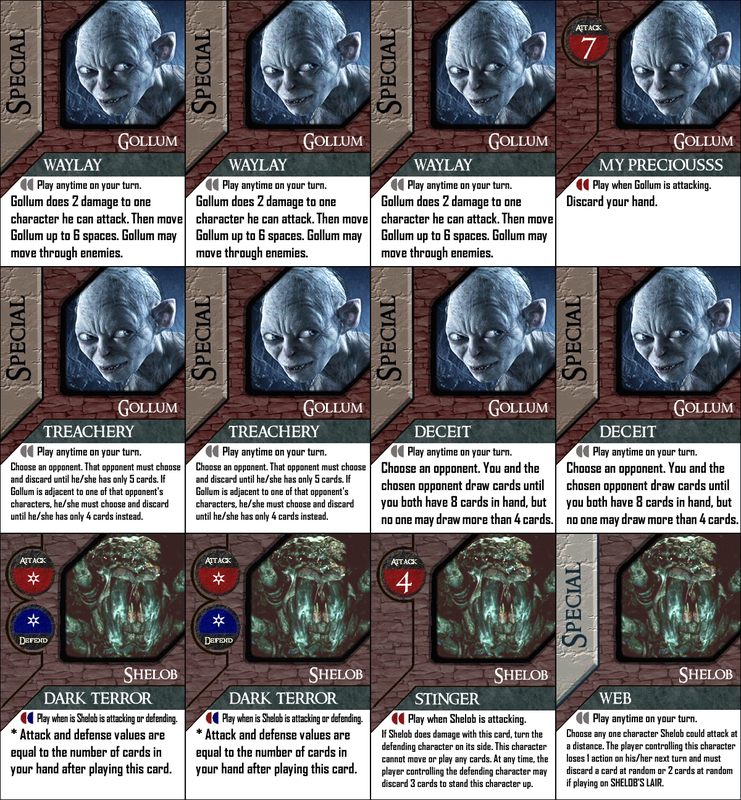 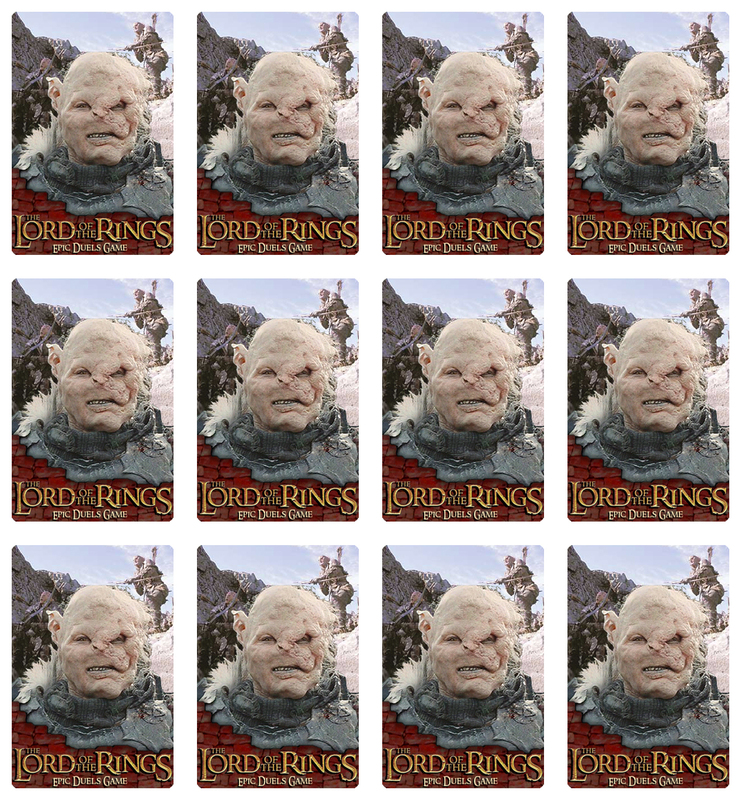 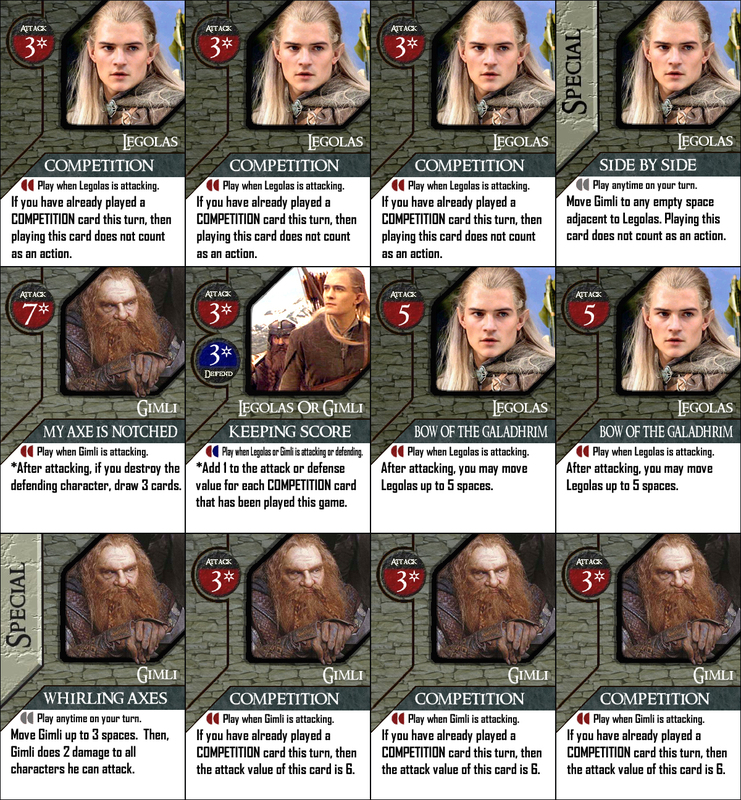 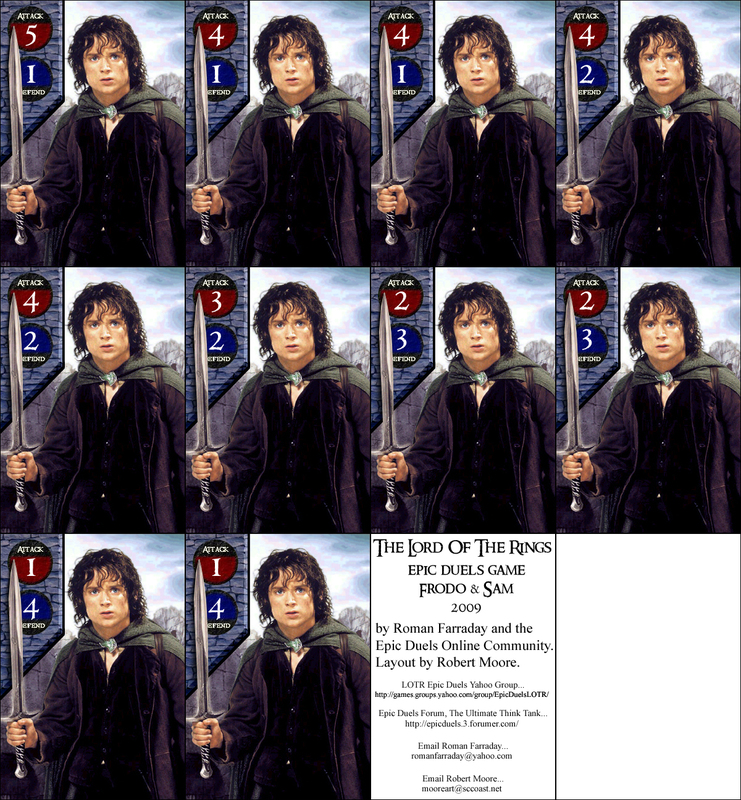 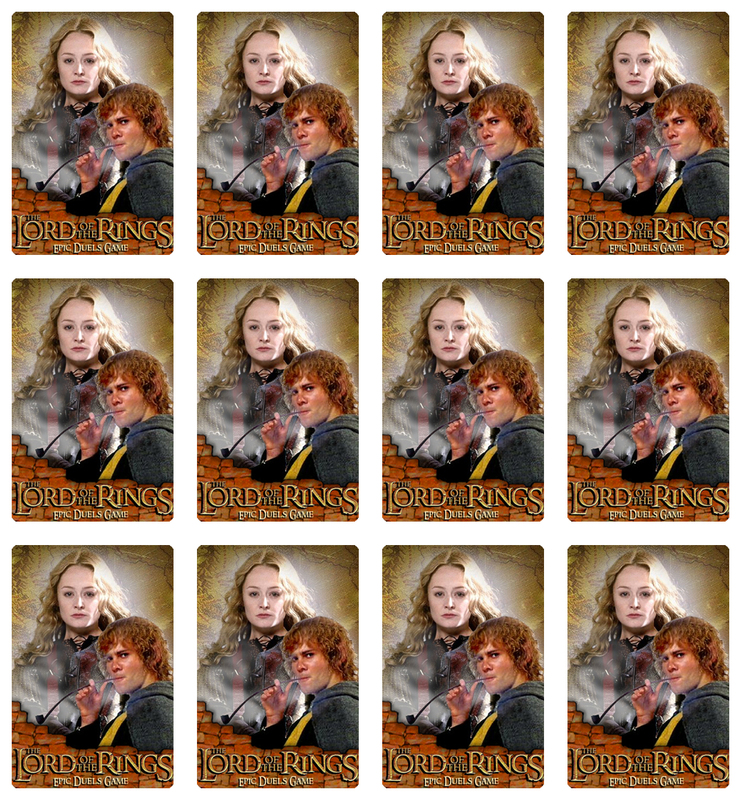 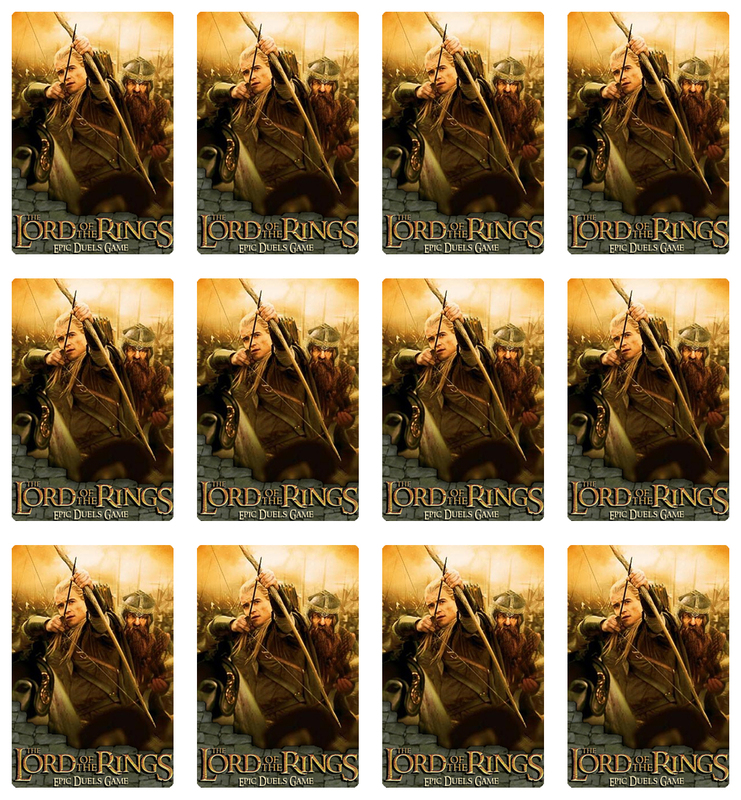 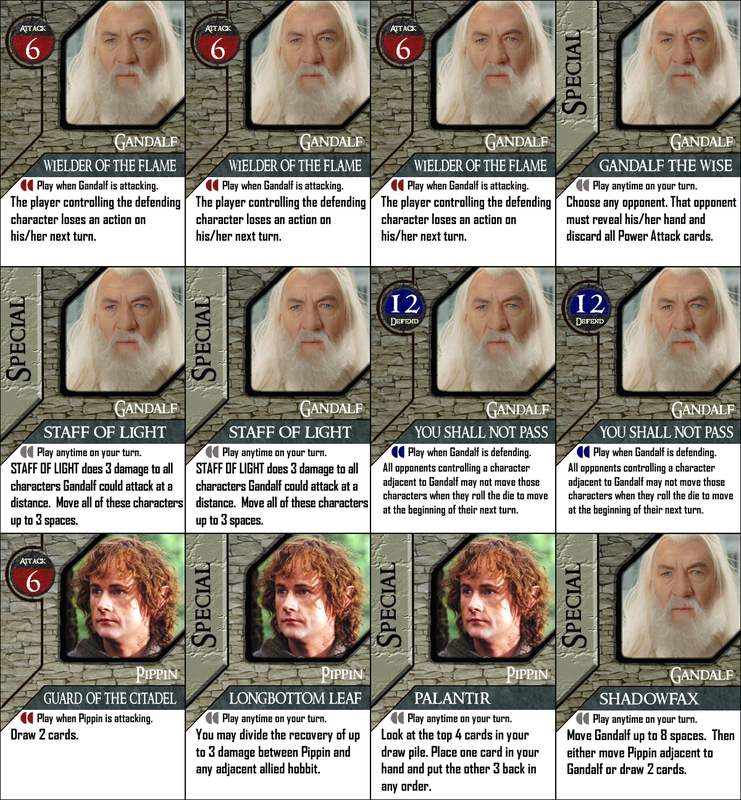 The final (for now) set of LOTRED decks is born of The Hobbit trilogy. 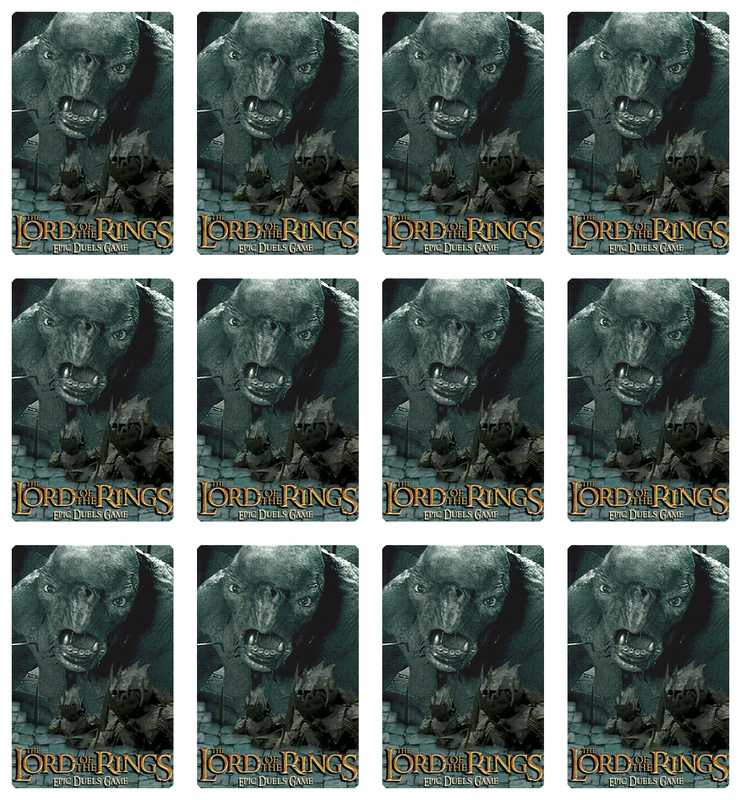 I’ll go ahead and tell you, they weren’t my favorite films, but they are full of colorful characters and epic, one-on-one battles. 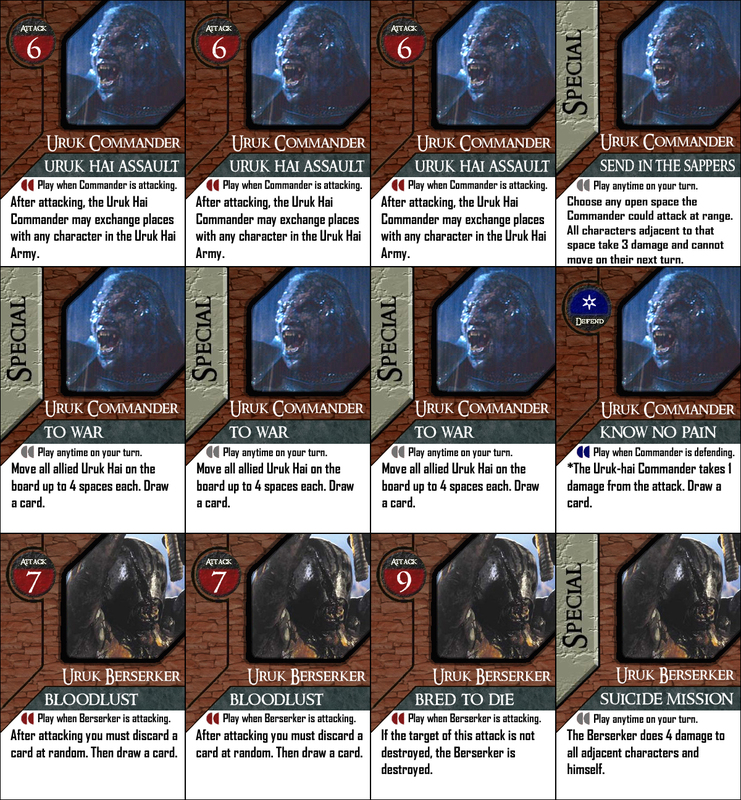 All of the characters included are worthy of a deck, and I think all 8 decks are interesting and fun. 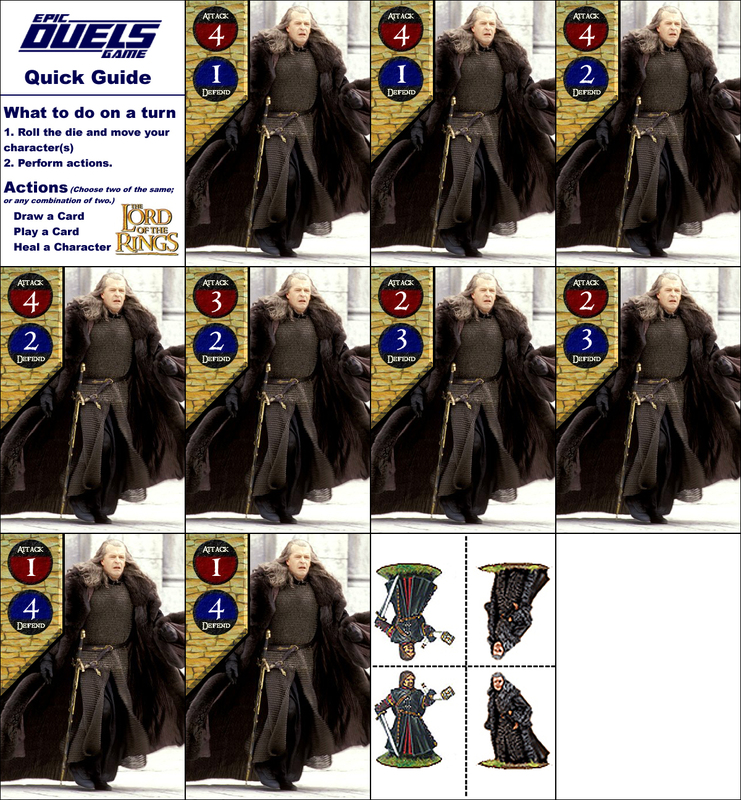 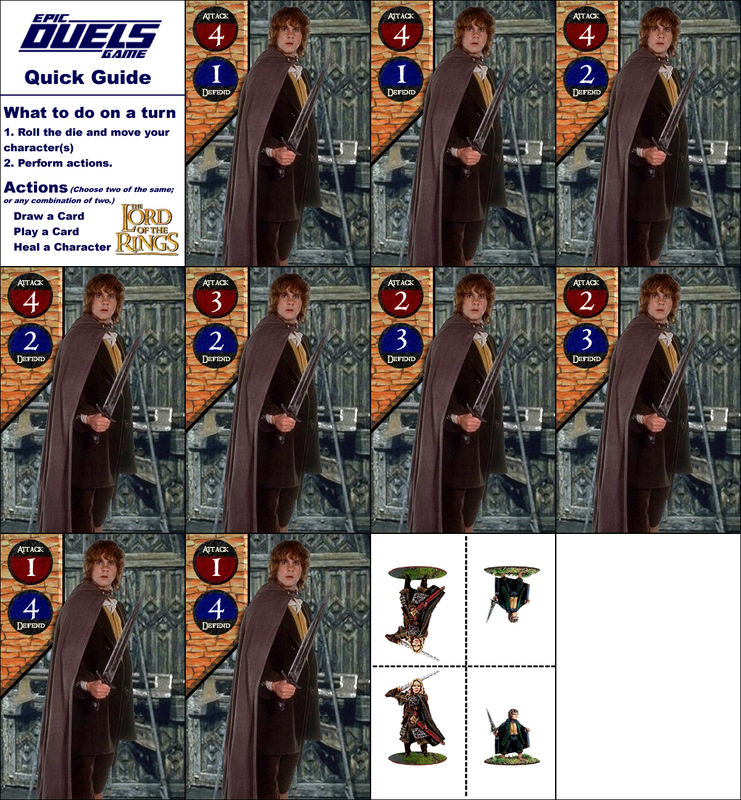 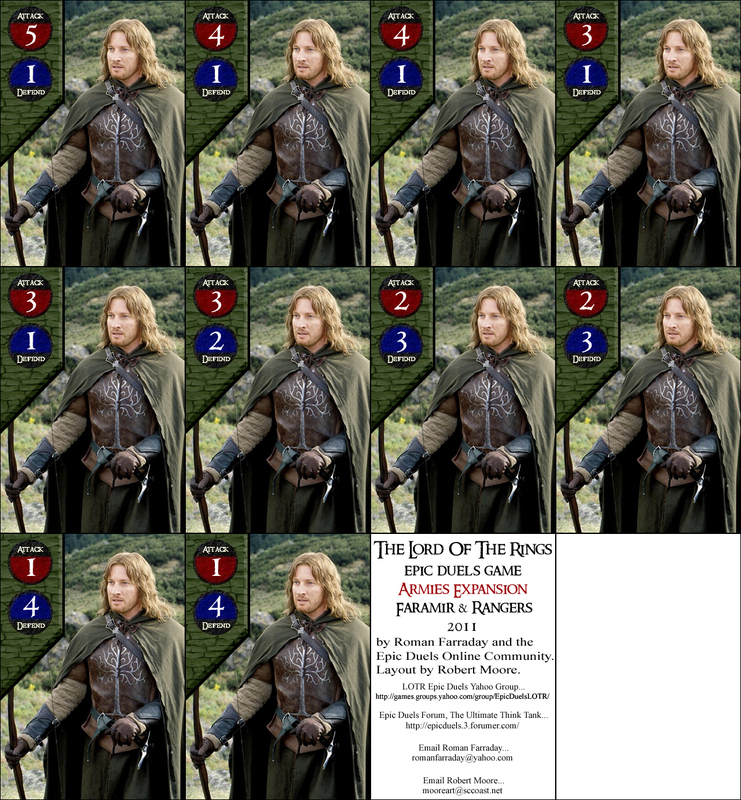 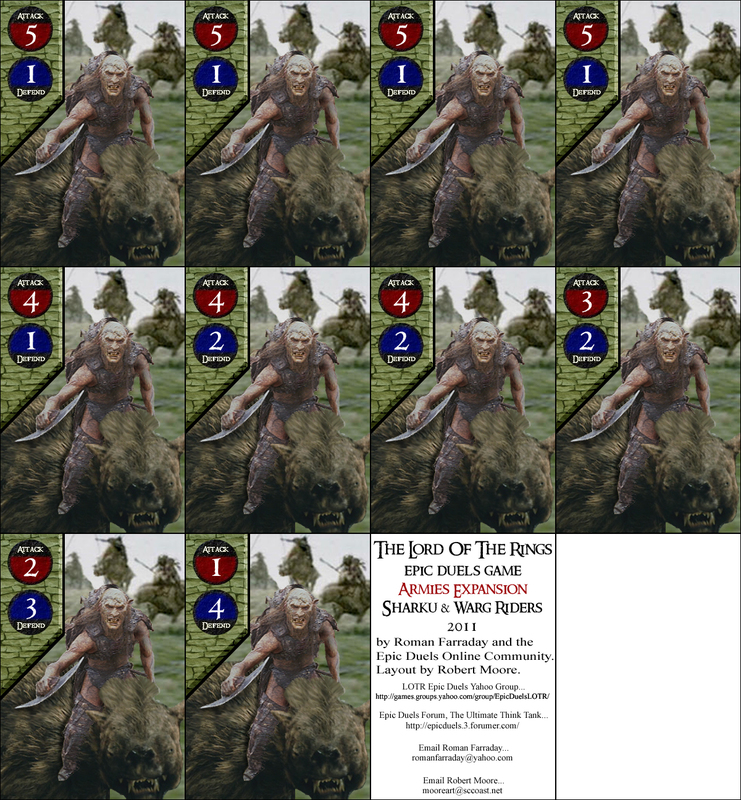 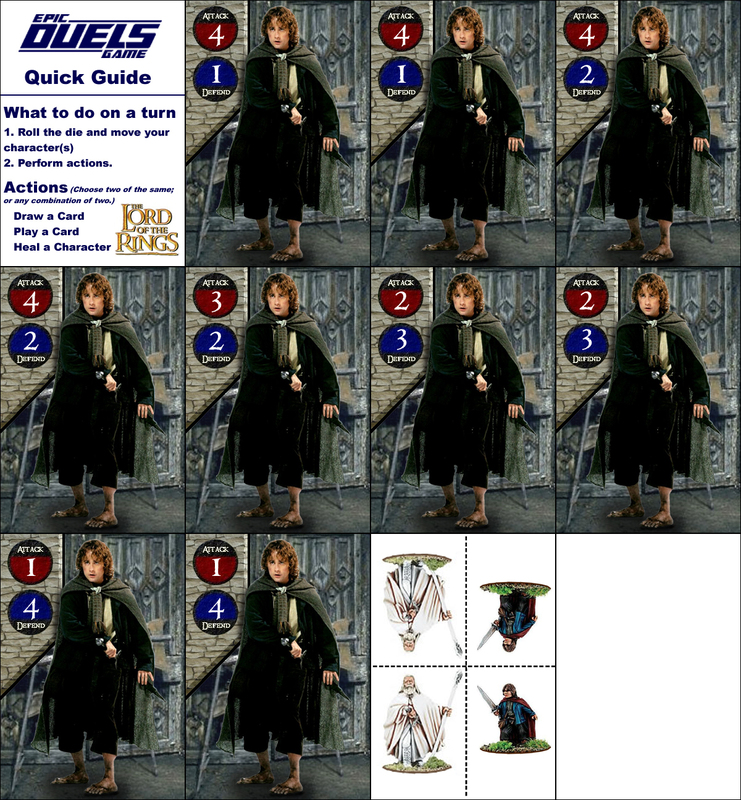 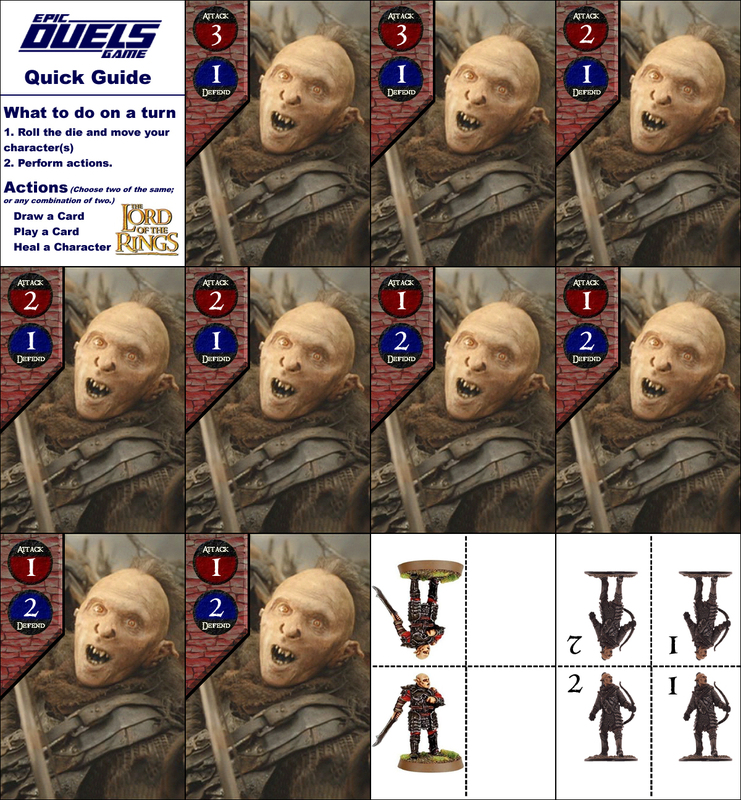 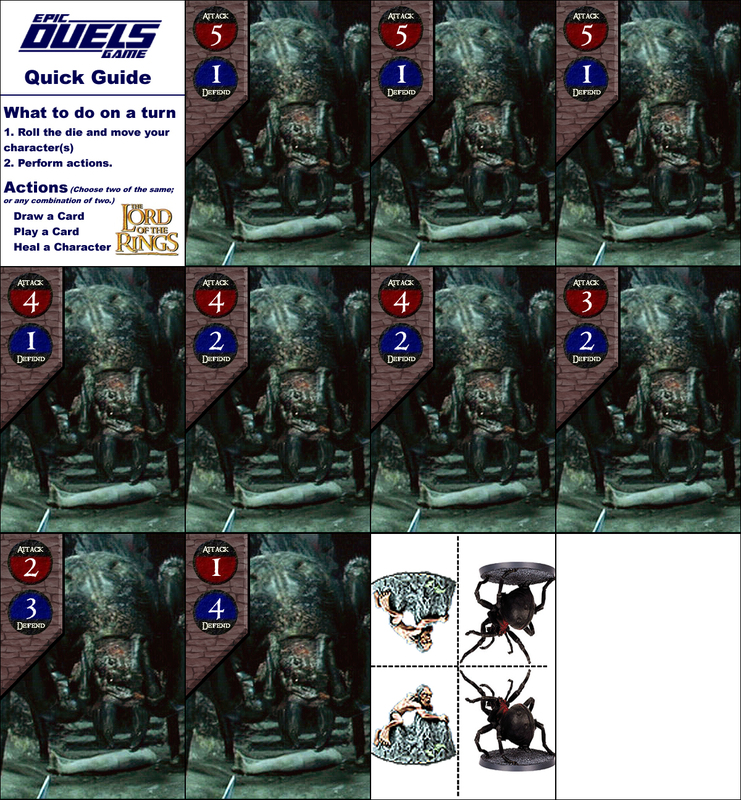 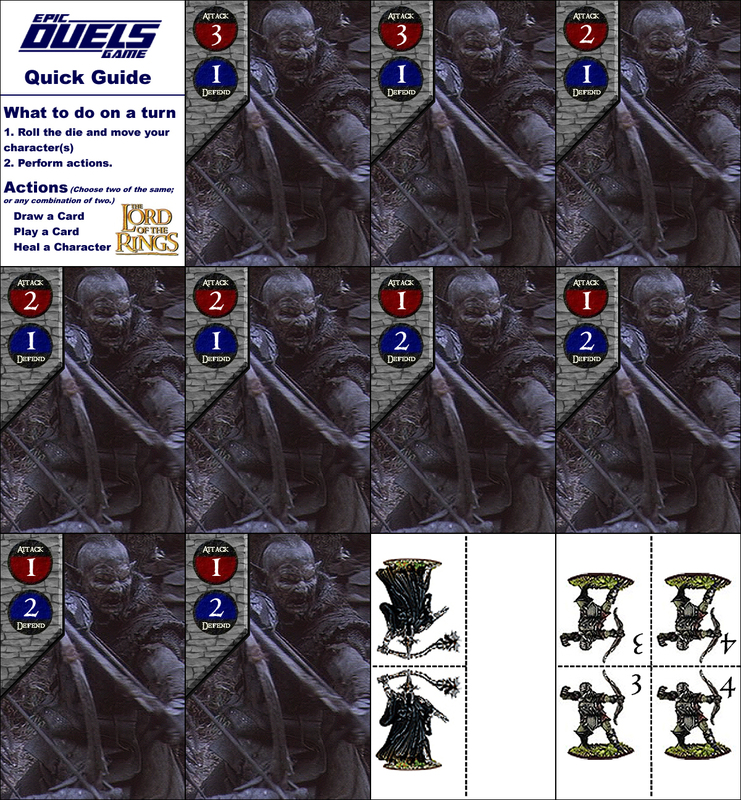 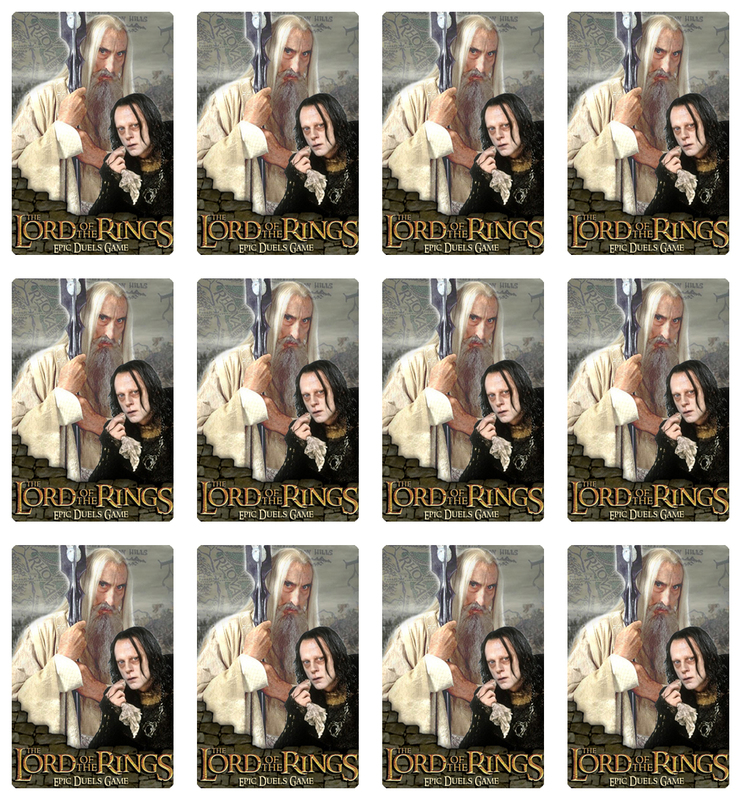 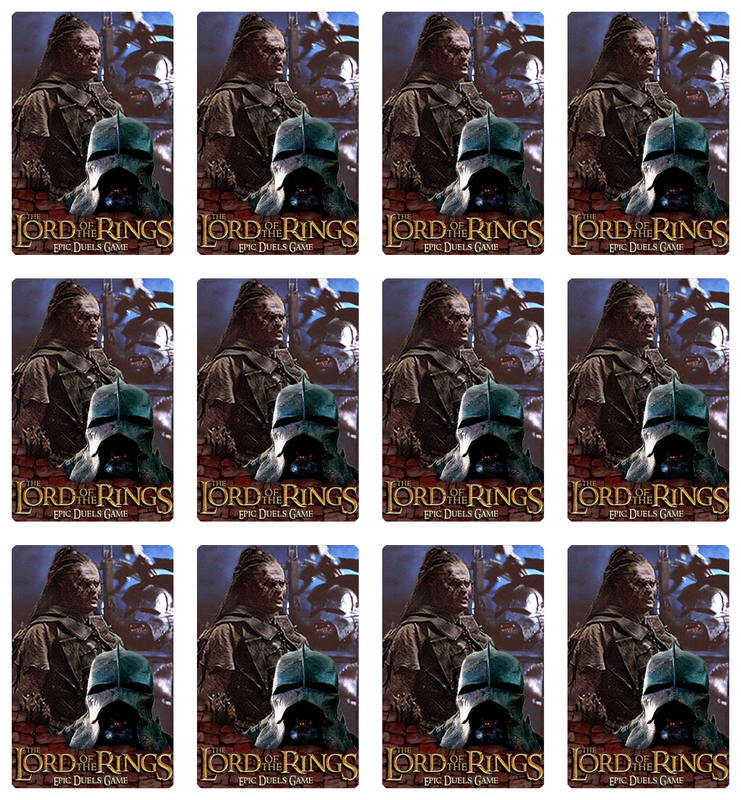 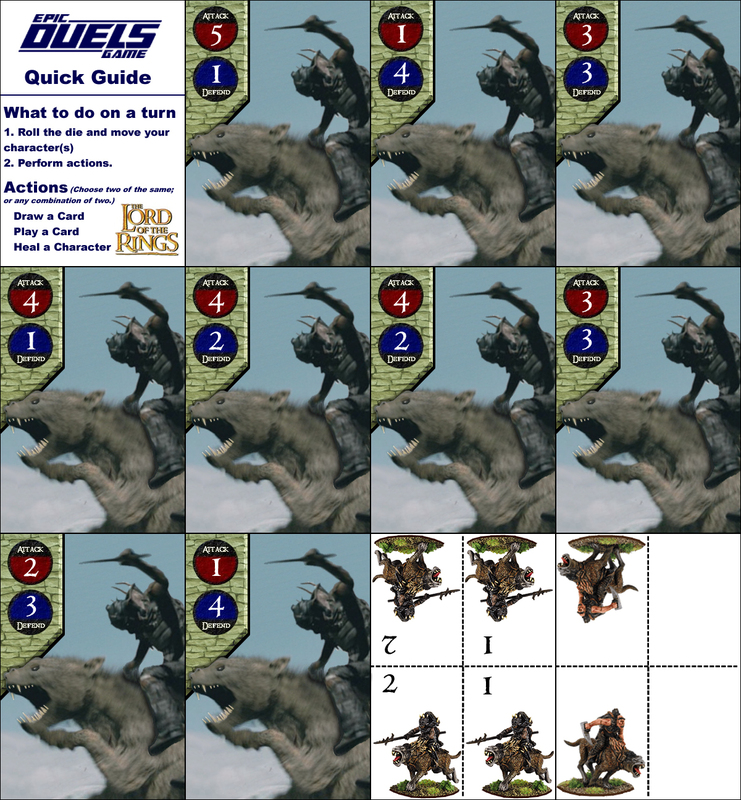 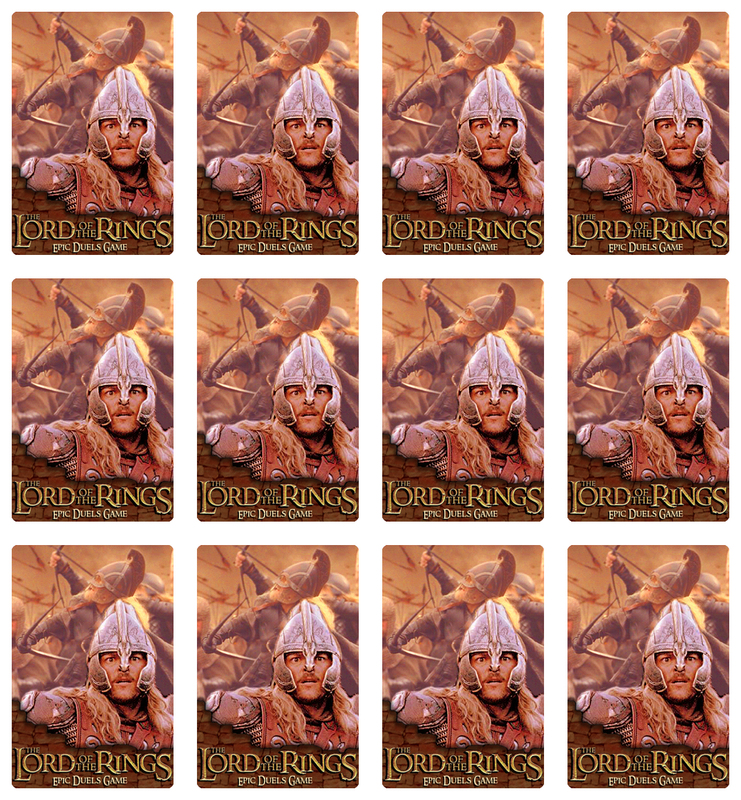 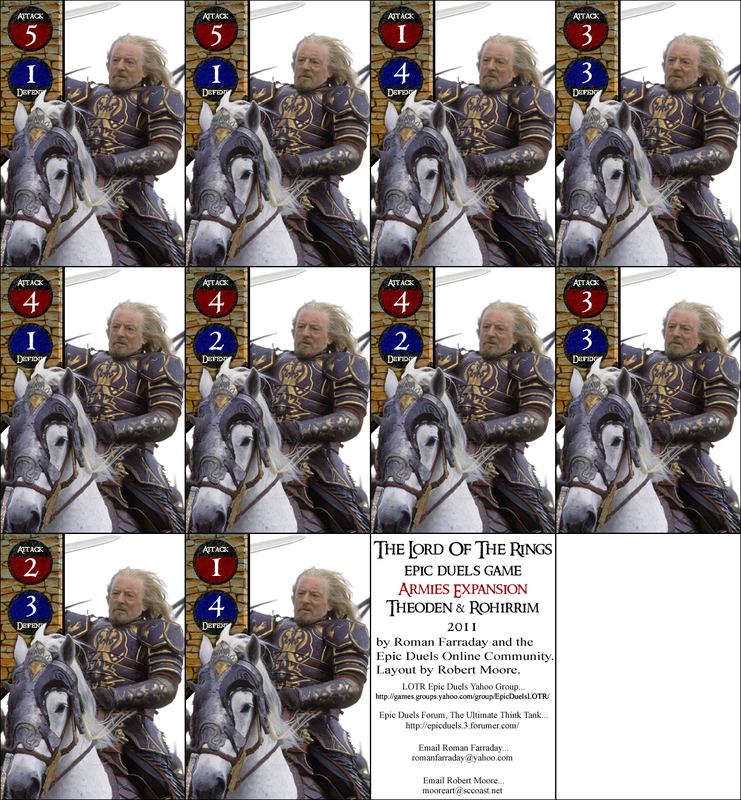 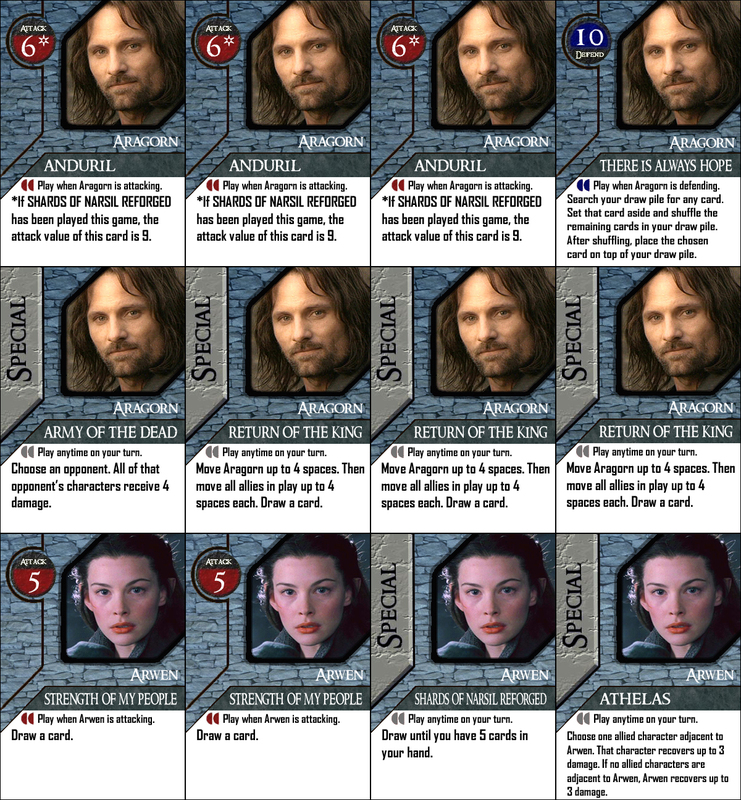 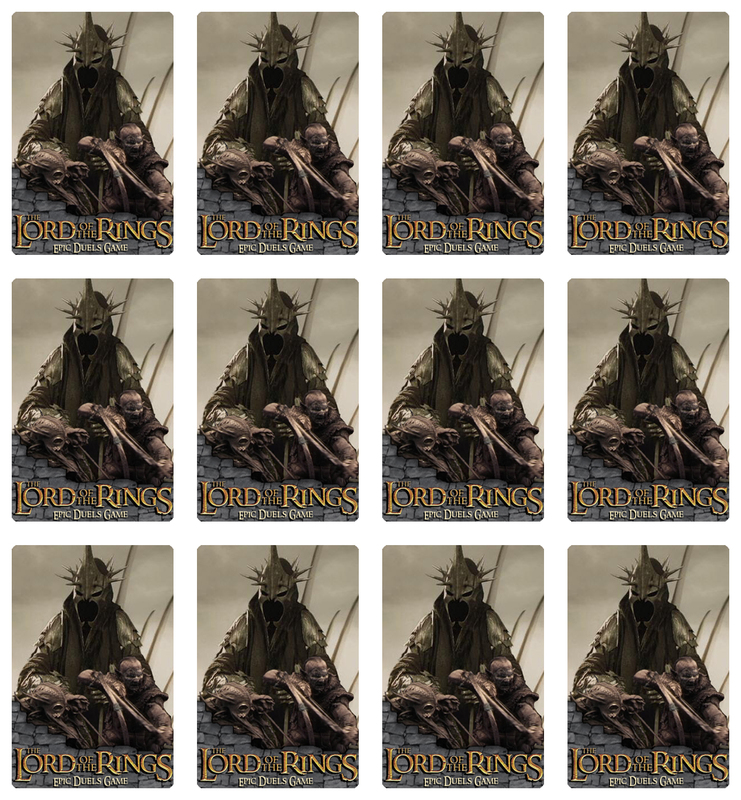 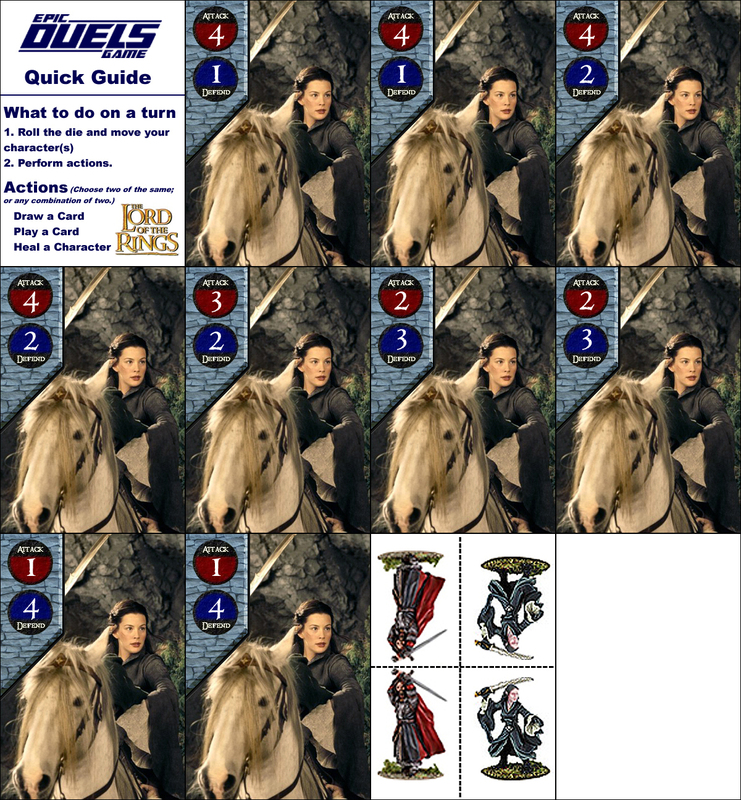 These were put together in Deck Designer so they are a little easier to print, and include cut-out figures, but they don’t have the Middle Earth style that Robert Moore provided. 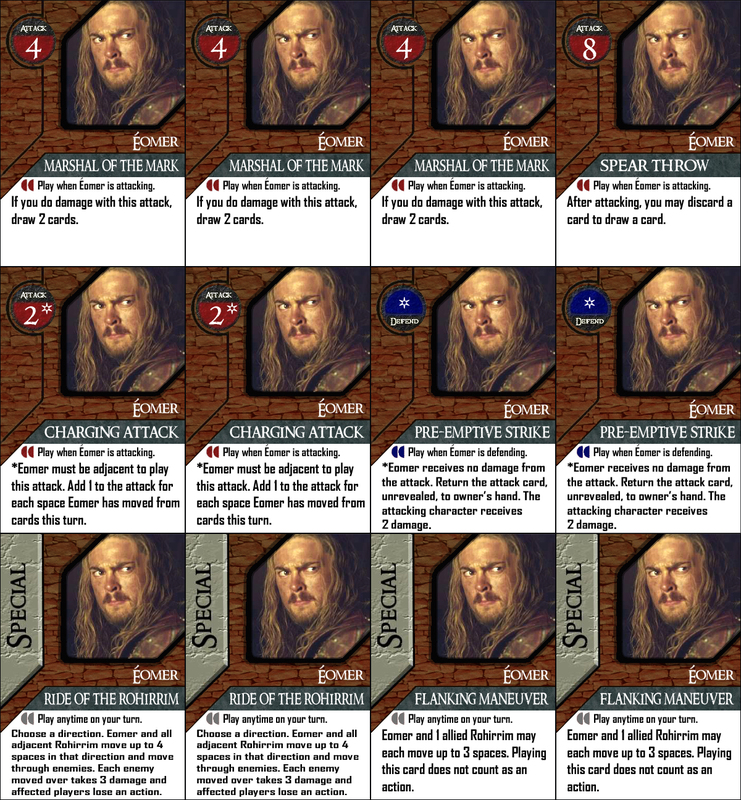 Maybe one day we can get Robert to put his design touch on these decks. 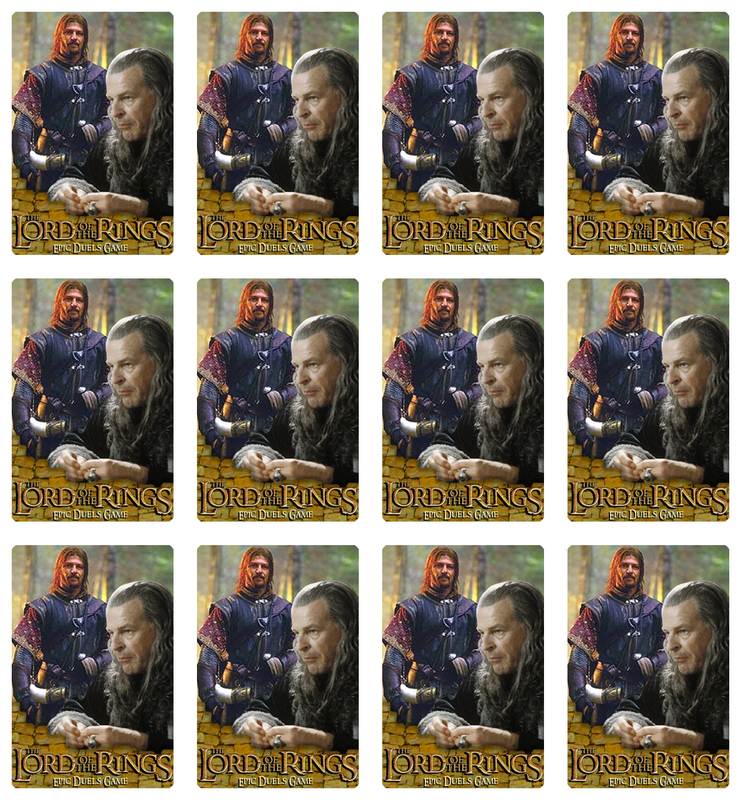 In the meantime, you have these. 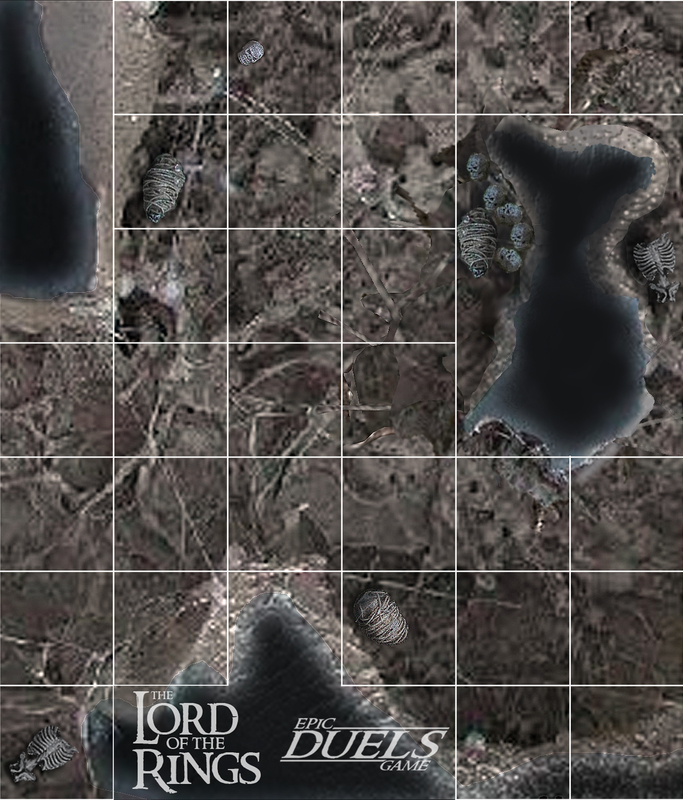 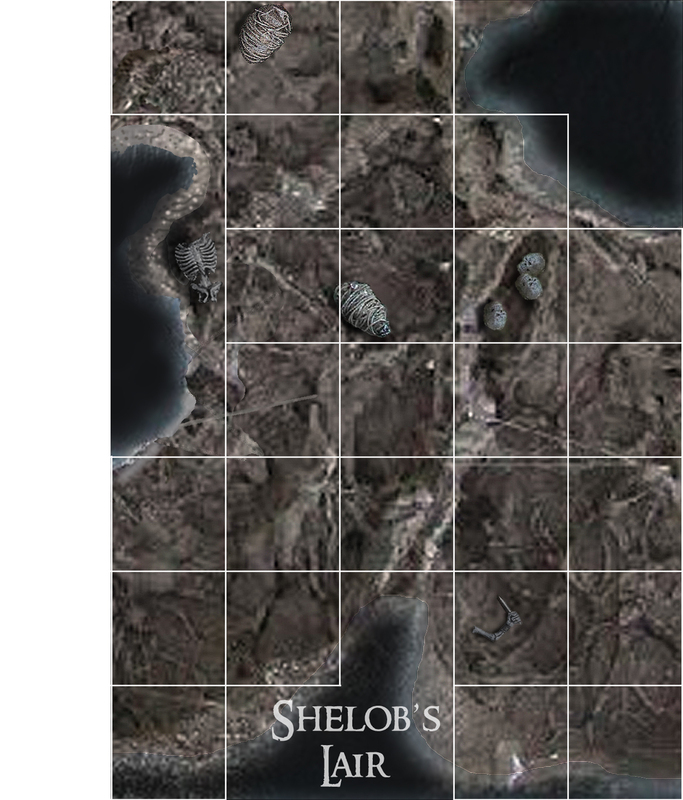 Last but not least are the LOTRED maps. 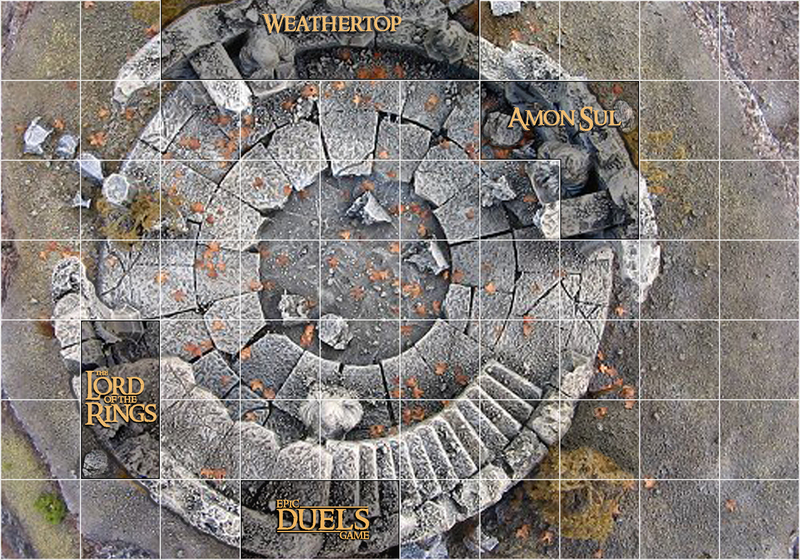 These next 2 maps were technically part of the Armies Expansion, but Weathertop is one of my all-time favorite Epic Duels maps of any genre. 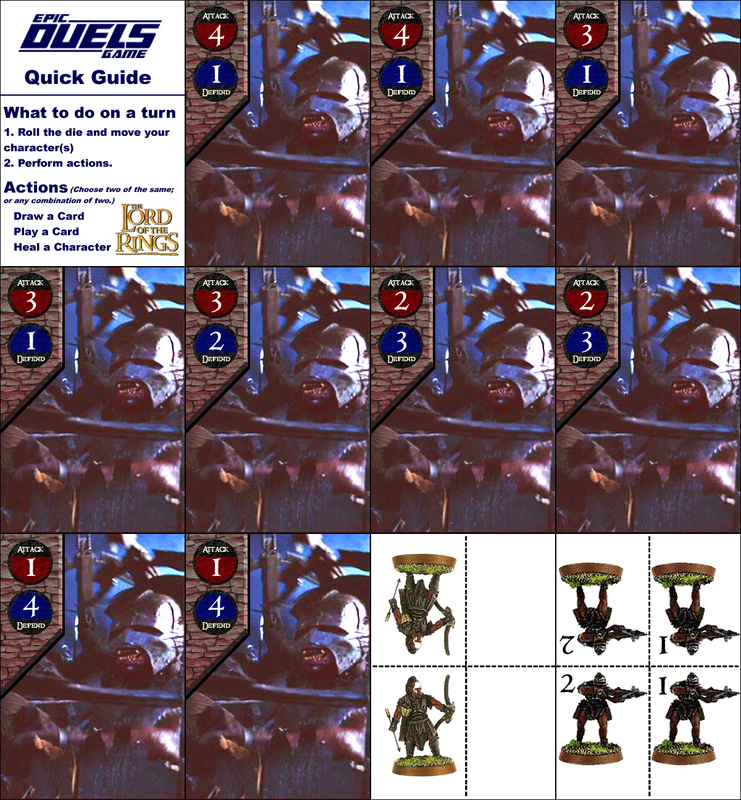 Also created by Robert Moore in .JPG form. 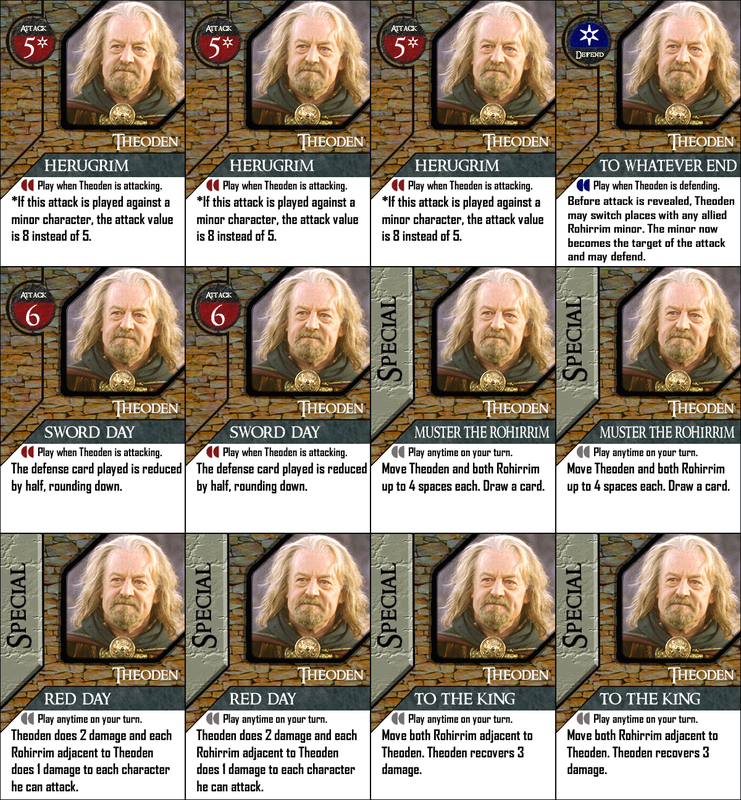 You’ll notice these are single files. 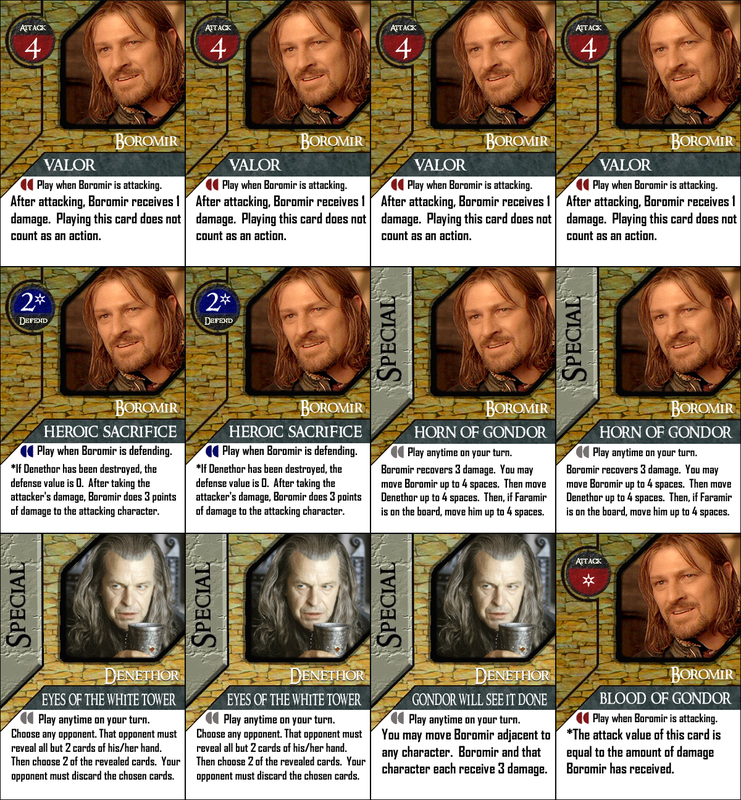 My memory is a bit foggy on this, but I think you will need to use a .JPG editor to split them into 2 for printing. 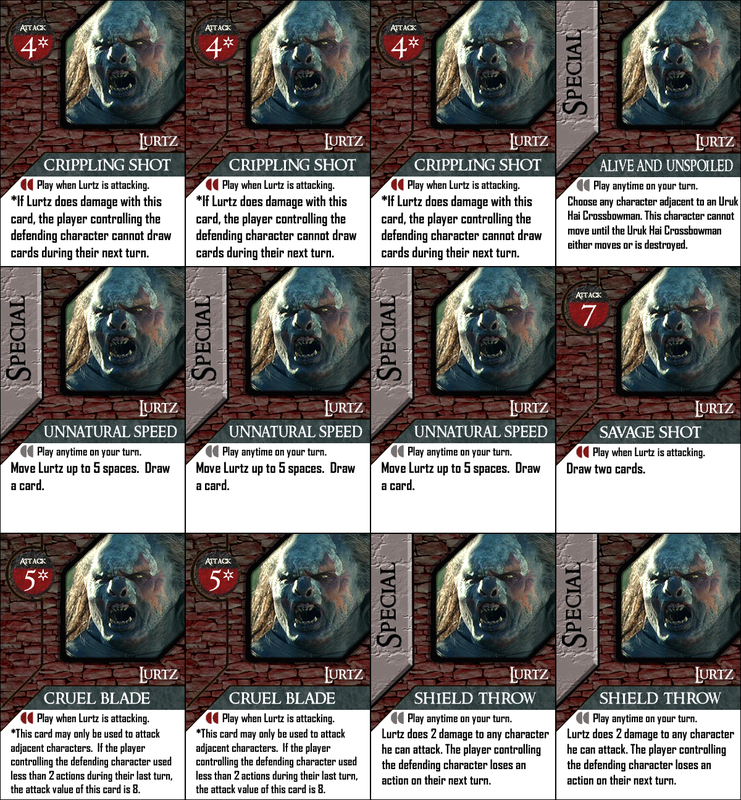 You want more? 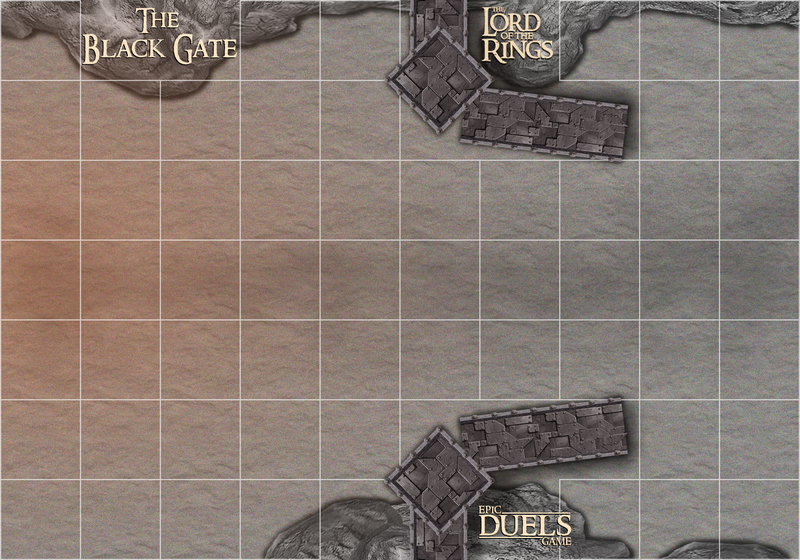 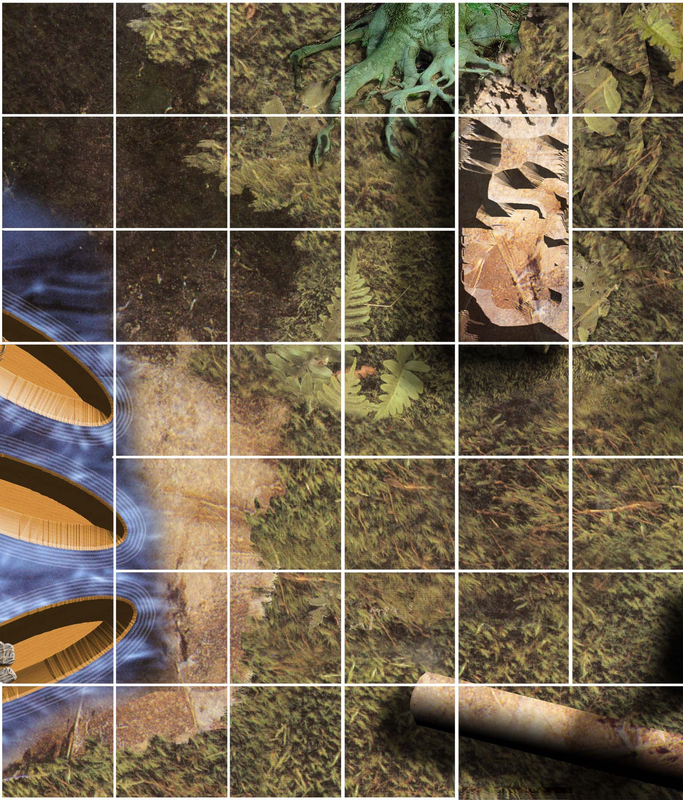 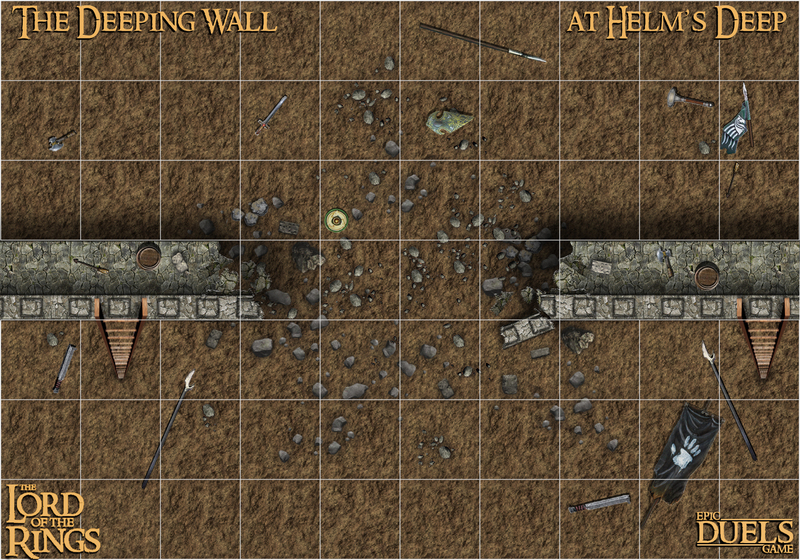 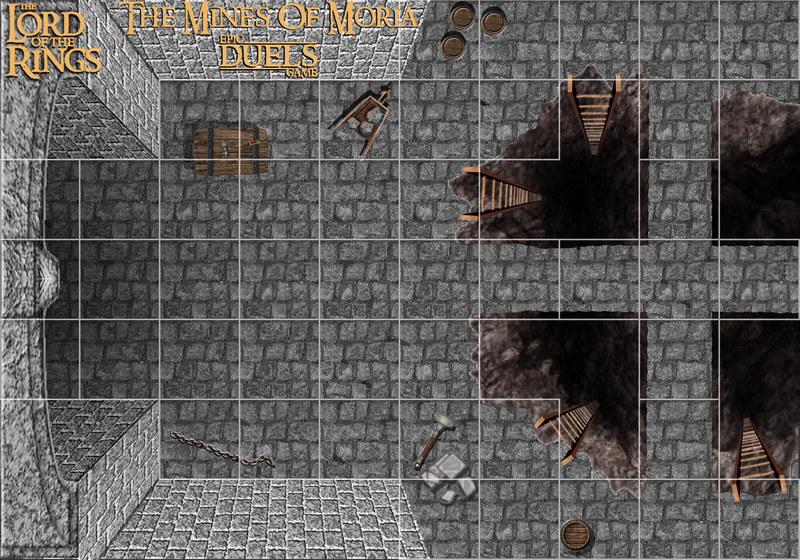 I haven’t personally played these, but Robert took it upon himself to create 2 more maps for your gaming pleasure. 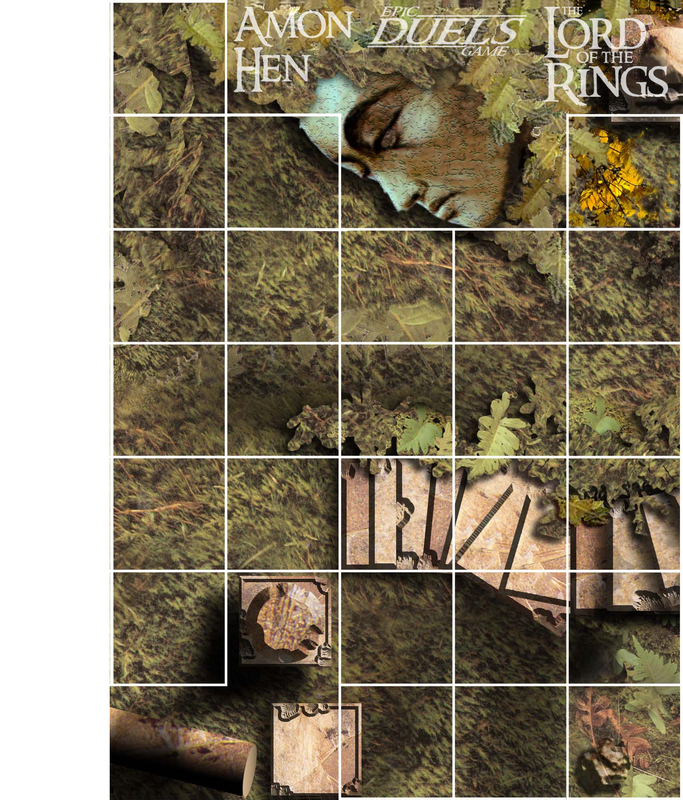 He actually had an Orthanc map once as well, but I can’t find that one and it had some flaws as I remember. 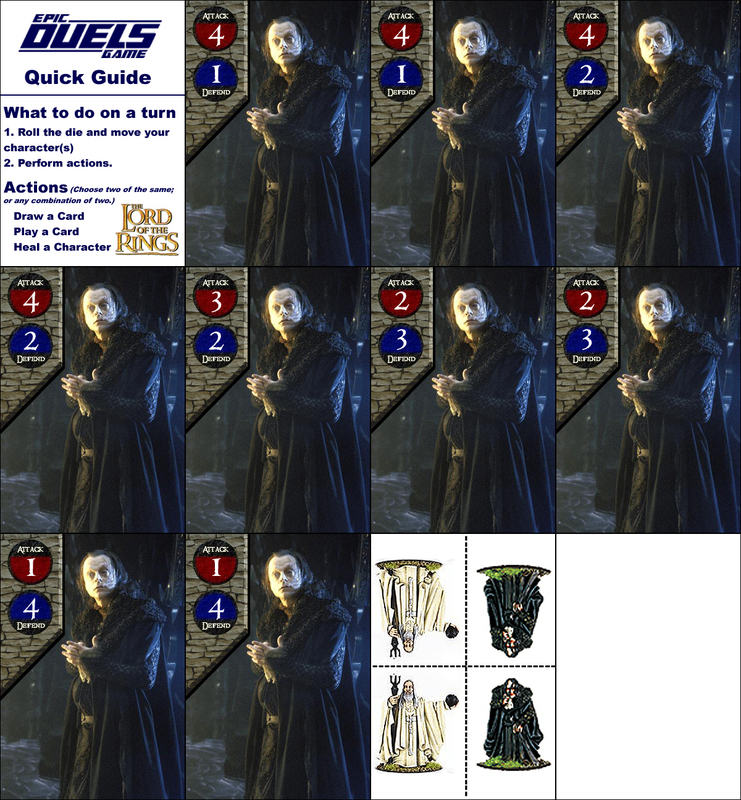 If you print any of the materials, please let us know how it goes for you!